Vienne is a commune in southeastern France, which lies along the Rhône River where the latter is joined by the Gère River, about 32 km south of Lyon. Today it is a small city, but was a major center of the Roman empire. The easiest and fastest way to travel from Lyon is by train. There is at least one train hourly and the journey lasts 22min give or take and costs €5-€7 one way. The trains depart from all three major Lyon stations (Lyon Jean Macé, Lyon-Part-Dieu and Gare de Lyon-Parrache). 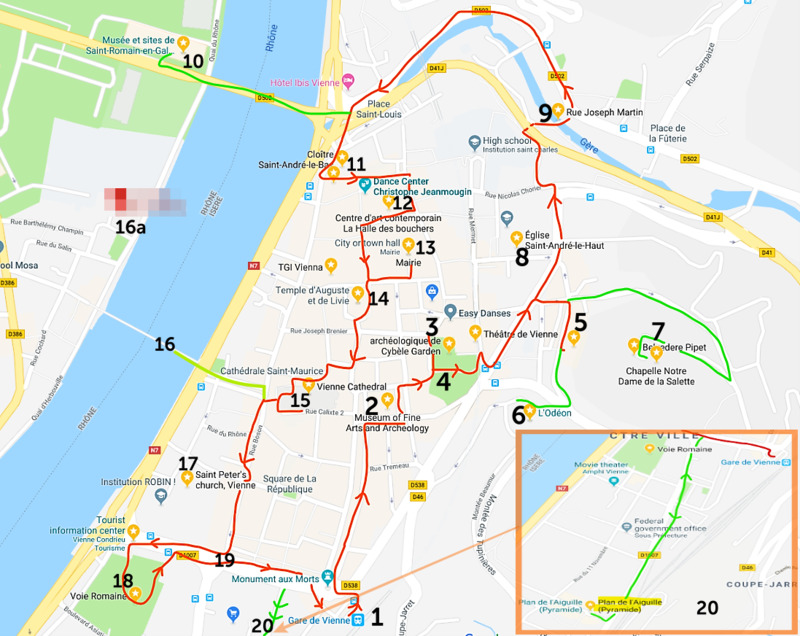 The train station in Vienne (Gare de Vienne) is located at the perimeter of the old town, so it is very easy from there to walk everywhere in the city, without having to take a bus or taxi. 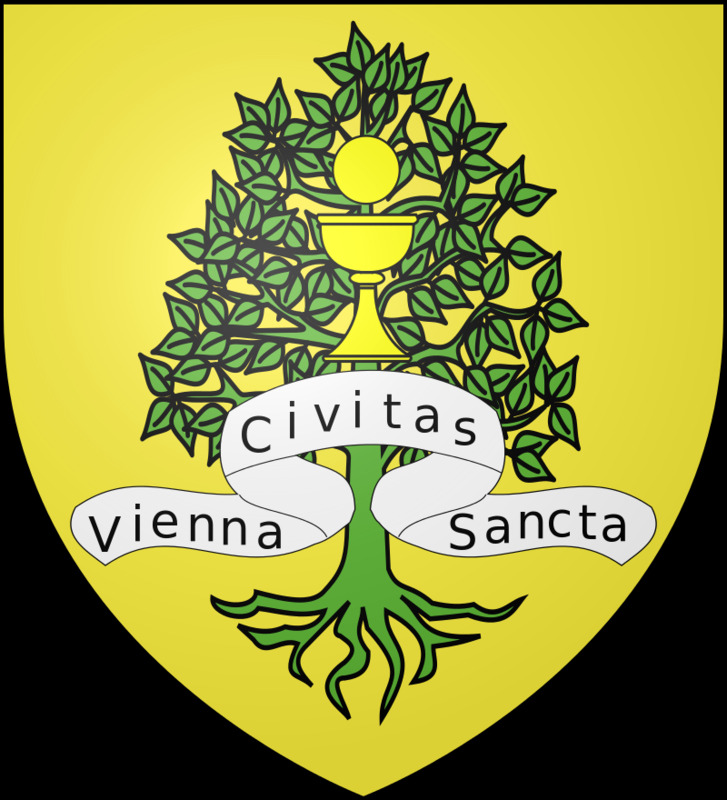 Coat of arms of Vienne. 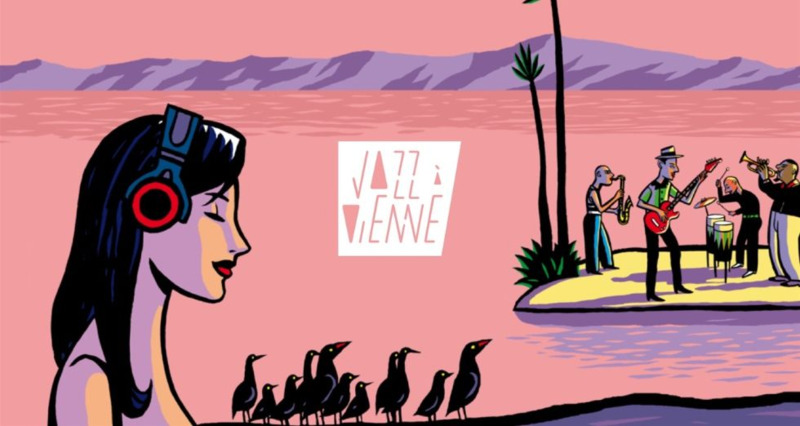 The 2019 poster of "Vienne Jazz Festival". 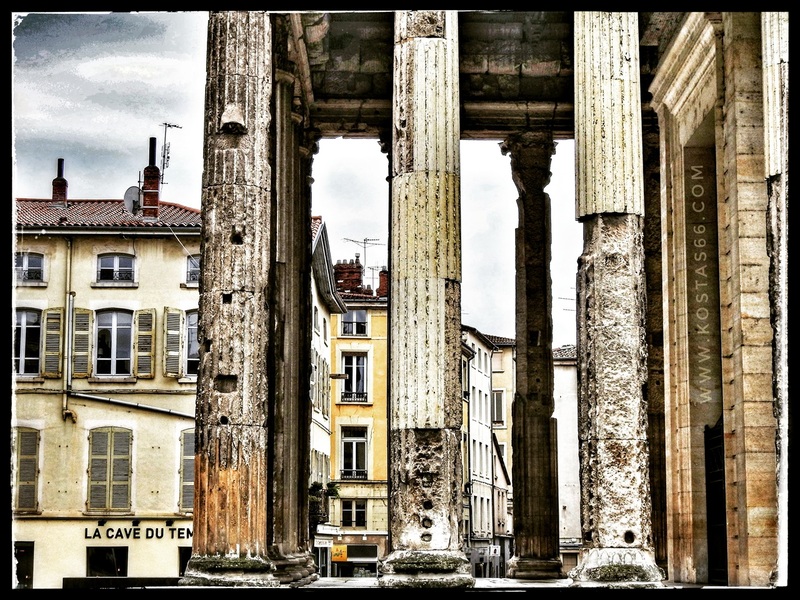 The city also hosts a major music event, the "Vienne Jazz Festival", in the prestigious surroundings of the Roman theatre every first fortnight in July. 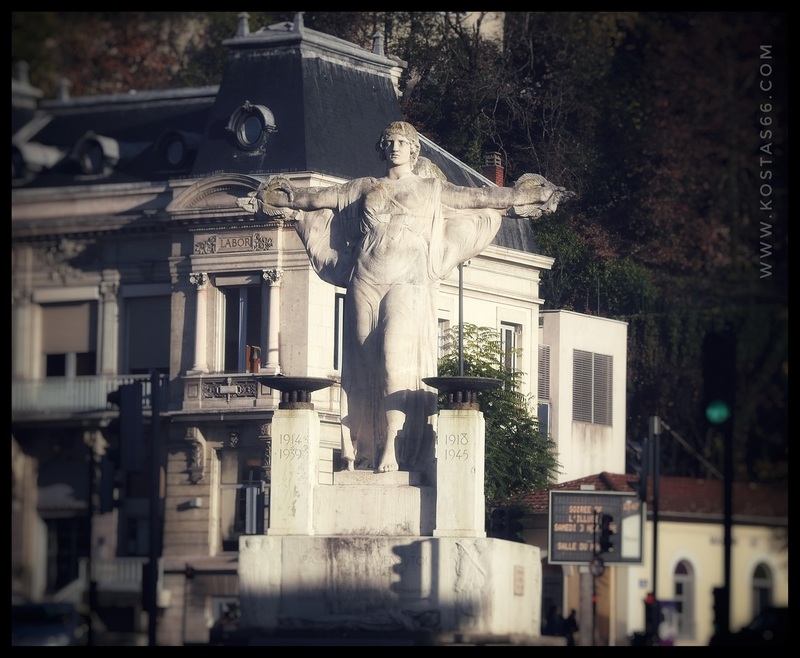 The festival was founded in 1981 and quickly became a staple of the French jazz scene with a wide variety of artist and exhibitions across its four stages, with the iconic Roman Theatre as its centrepiece. A must for all jazz fans. 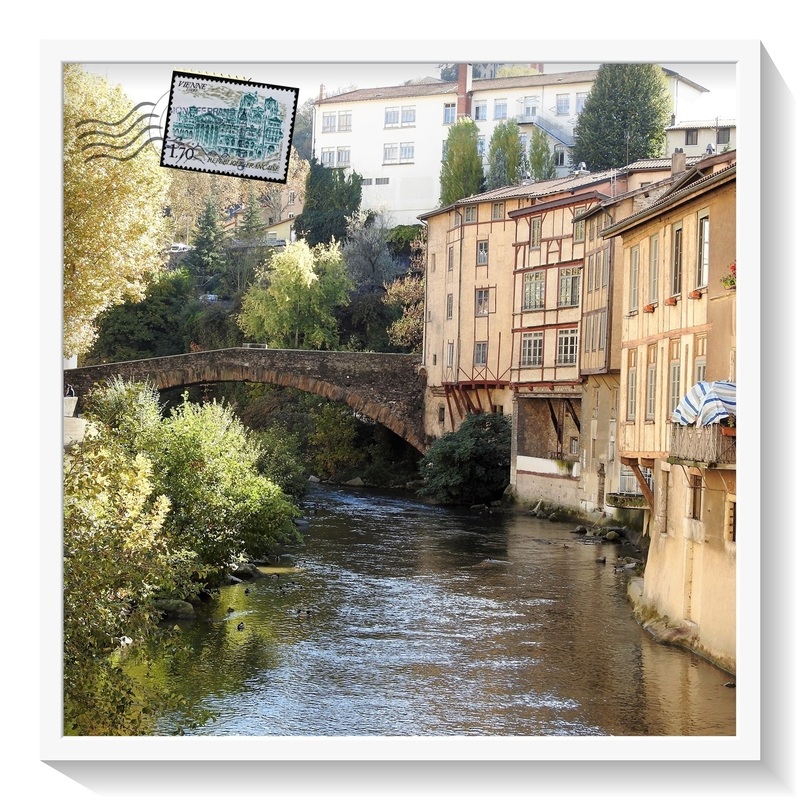 A postcard from Pont-Saint-Martin on Gère River. The old town lies in a depression that is surrounded by steep hills. 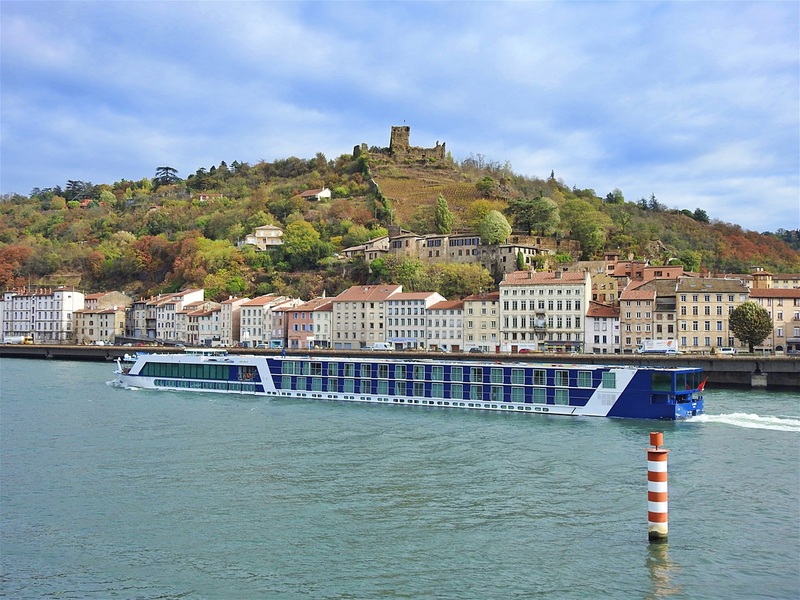 It is shaped like a perfect parallelogram (1km long and 0.5km wide) and is located on the left bank of the Rhone river. Its northern border is defined by the smaller Gère River. 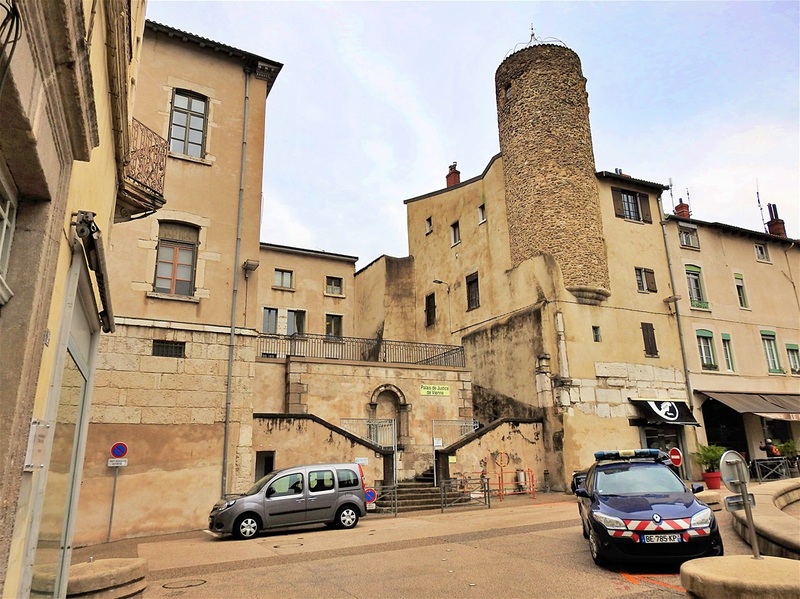 Vienne is among the richest French repositories of Roman and medieval buildings, of which the only one located outside this parallelogram is Plan de l'Aiguille (Pyramide), located 1km south to the train station. 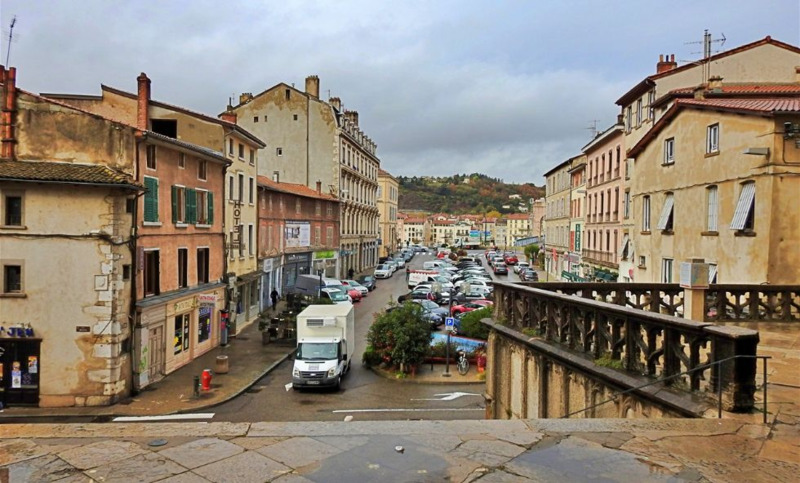 The part of the town, where all tourist atractions are located, is flat, except the Pipet hill in the north-east, where the Roman theater and Chapelle Notre Dame de la Salette are located. The pastel colors of the medieval town. The oppidum (=large fortified Iron Age settlement) of the Allobroges (=a Gallic tribe of ancient Gaul, located between the Rhône River and Lake Geneva) was conquered by the Romans in 121 BC and was subsequently one of the most important towns of Gaul until Roman rule of the area ended in 275 AD. The Allobroges rebeled several times again the Romans. In the year 43 BC, for the Gauls of Vienne it's the call to battle. They have recently learned of the assassination of Julius Caesar. Now that their old enemy has ceased to be a threat, they were no longer afraid to chase away the Romans living in their city. 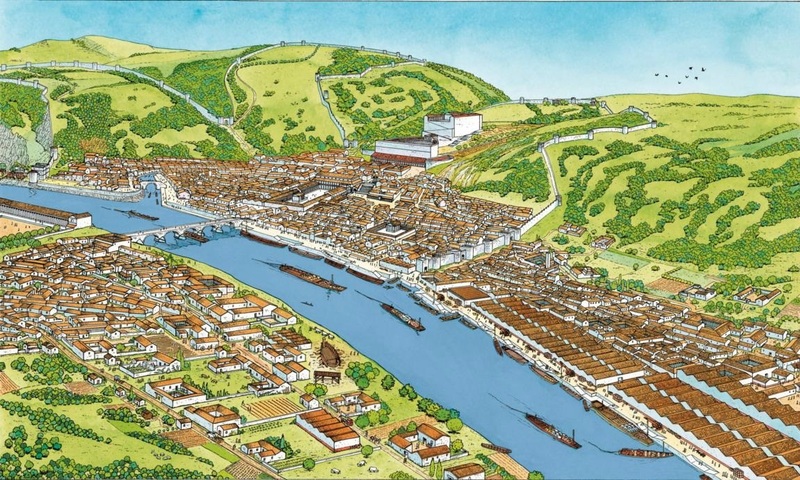 The exiles then founded the colony of Lugdunum (today's Lyon). In 257 Postumus was proclaimed emperor here of a short-lived Gallo-Roman empire. 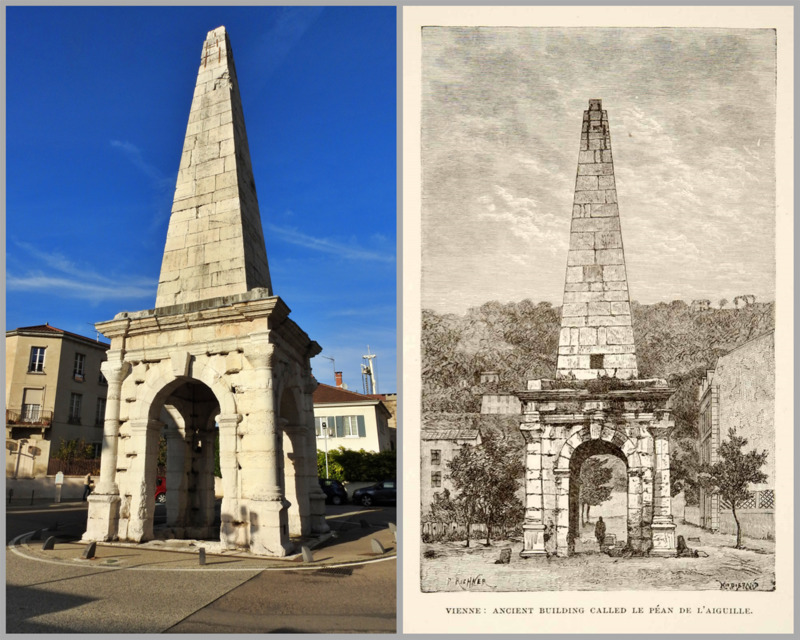 Important Roman monuments still stand at Vienne. 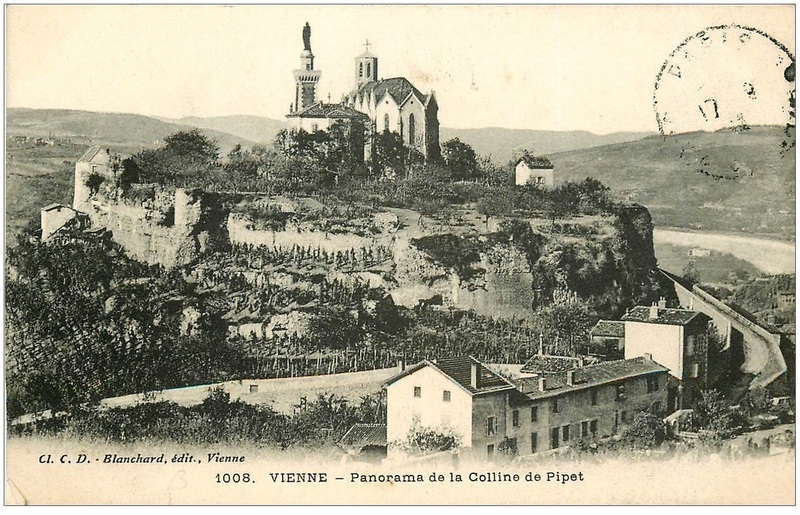 Vienne, as the provincial capital, was an important early seat of a bishop. According to sources, there were Christians here in 177. The first historical bishop was Verus, who was present at the Council of Arles (314). About 450, Vienne's bishops became archbishops. 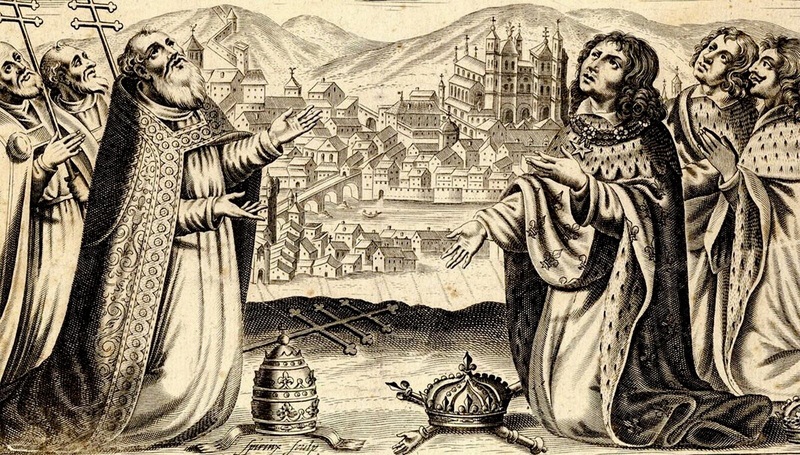 Vienne's archbishops and those of Lyon disputed the title of "Primate of All the Gauls" based on the dates of founding of the cities compared to the dates of founding of the bishoprics. Late in the 9th century the town became part of the Holy Roman Empire, and it was transferred to French sovereignty in 1450. Medieval Vienne is best known for the Council of Vienne, the fifteenth Ecumenical Council of the Roman Catholic Church that met between 1311 and 1312 in the city. Its principal act was to withdraw papal support for the Knights Templar on the instigation of Philip IV of France, after the French monarch attacked Rome and killed Pope Boniface VIII (Attack at Agnani). Philip the Fair and Pope Clement V at the Council of Vienne where will be decided the fate of the Templars. One needs only half a day to walk around and enjoy this beautiful old town, unless you want also to visit some of the museums, in which case consider a full day walk. A walk around the old town (red line) and some detours (green lines). Follow the map above. Numbers in black  indicate an attraction, but most important is to walk, feel and absorb some of the atmosphere of this amazing roman-medieval city. We start our walk from the Train Station (Gare SCNF) , which started operation in 1854. 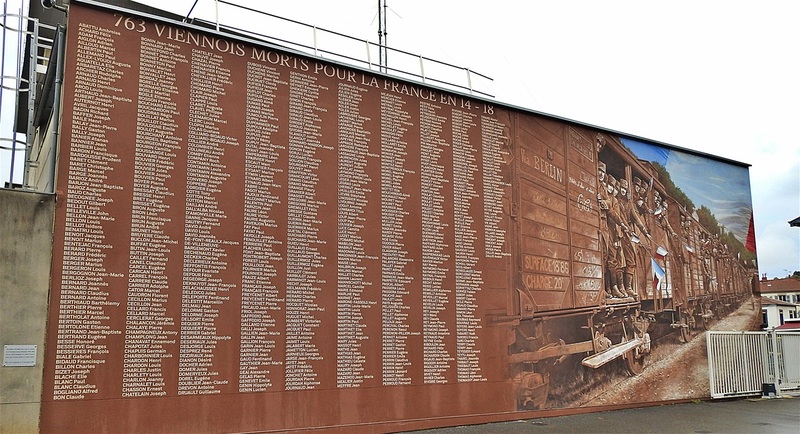 At the tracks area there is a big placard/monument dedicated to the people from Vienne killed during the WWI. The inscription reads: 763 VIENNOIS MORTS POUR LA FRANCE EN 14-18 (763 Dead Viennois For France in 14-18). 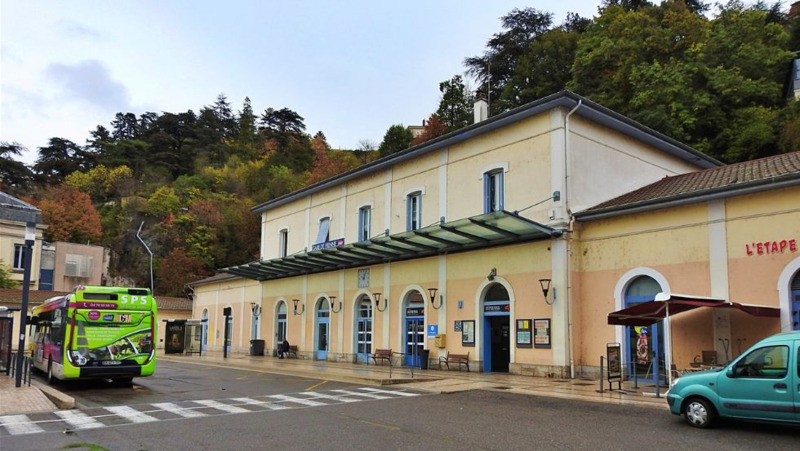 The Train Station (Gare SCNF) of Vienne. The monument dedicated to the people from Vienne killed during the WWI, inside the train station. In front of the station (Place Pierre Semard) there are taxi stands and bus stops to many destinations in and around the city. At the roundabout in front of Place Pierre Semard stands an impressive monument (Monument aux Morts) dedicated to those died during the two World Wars. The inscription reads: PASSANT SOUVIENS TOI/ À LA MÉMOIRE ET À LA GLOIRE DES COMBATTANTS/ DE LA GRANDE GUERRE (To the Memory and Glory of Fighters of The Great War). The Museum of Fine Arts and Archeology. Continue north on Cours Romestang till you see the car parking lot (Place Miremont) in front of the Museum of Fine Arts and Archeology (Musée des Beaux-arts et d’Archéologie) . The Museum has been open to the public since 1895. It was the mayor of Vienne Teyssière de Miremont who, in 1823, built here the grains market (la halle aux grains) and gave its name to the square around it. The building we see today erected in the 1890s in order to accommodate the museum and the municipal library. It presents local archaeological collections from the Neolithic era to the end of antiquity. One block to the east, stands a small park. The "Garden of Cybele" (Jardin archéologique de Cybèle)  is an archaeological garden with the remains of the institutional district of the Gallo-Roman city, the forum. It is consistent of 3 key spaces: a) Two arcades of an imposing portal decorated with ornamental motifs, which shows the importance of the forum in the Roman urban planning. b) A wall of a large unit probably intended to accommodate the meetings of the municipal assembly. c) A luxurious city house (domus) with important dimensions and with terraces. The 15th century house at the north-western point of the the Garden of Cybele. At the north-western point of the archeological park stands a 15th century house . Cross the archeological park uphill. 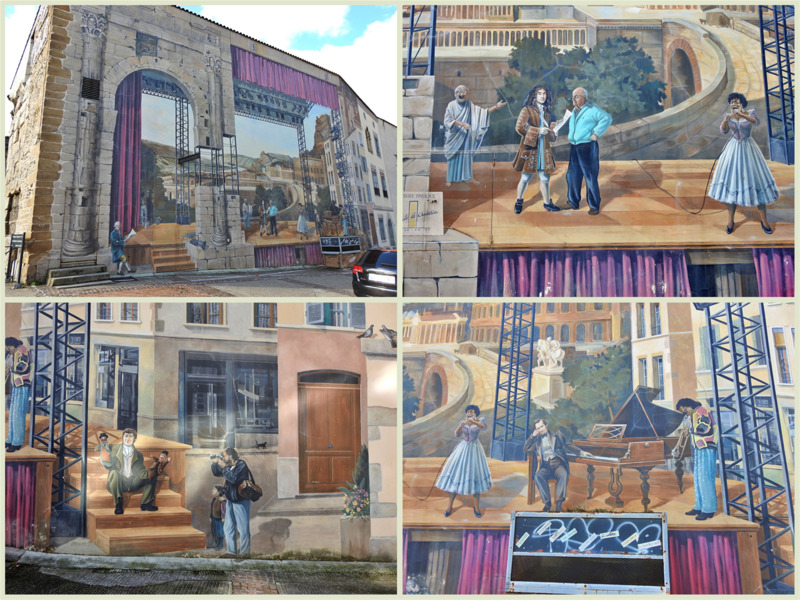 On the upper side of the park, on Passage St Antoine, you will see a huge trompe-l'œil wall painting, called "Scènes de Vienne", by the Lyon artists of the "Cité de la Création" artist group (a mural comparable to those in Lyon). The mural represents a theater stage, with musicians, singers, puppeteers and actors on it. This is the back side of the Théâtre de Vienne, an historical monument, an authentic Italian-style theater built in 1782. The entrance to the theater is from inside the park, via a ramp. The facade of the Théâtre de Vienne in the ancient forum. The "Scènes de Vienne" mural. 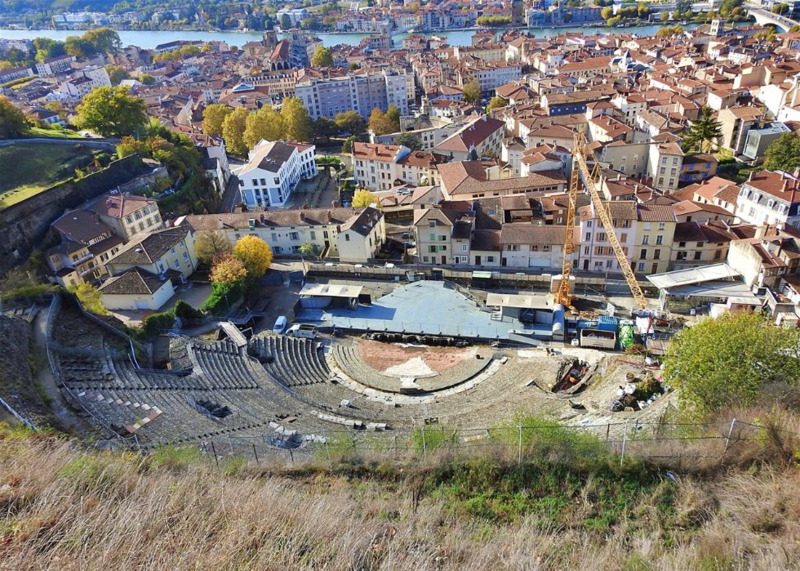 The Roman Theater (Théâtre Antique de Vienne) seen from Pipet Hill. On the east of the Forum the roads start to go uphill as we are already at the foothills of the Pipet Hill. 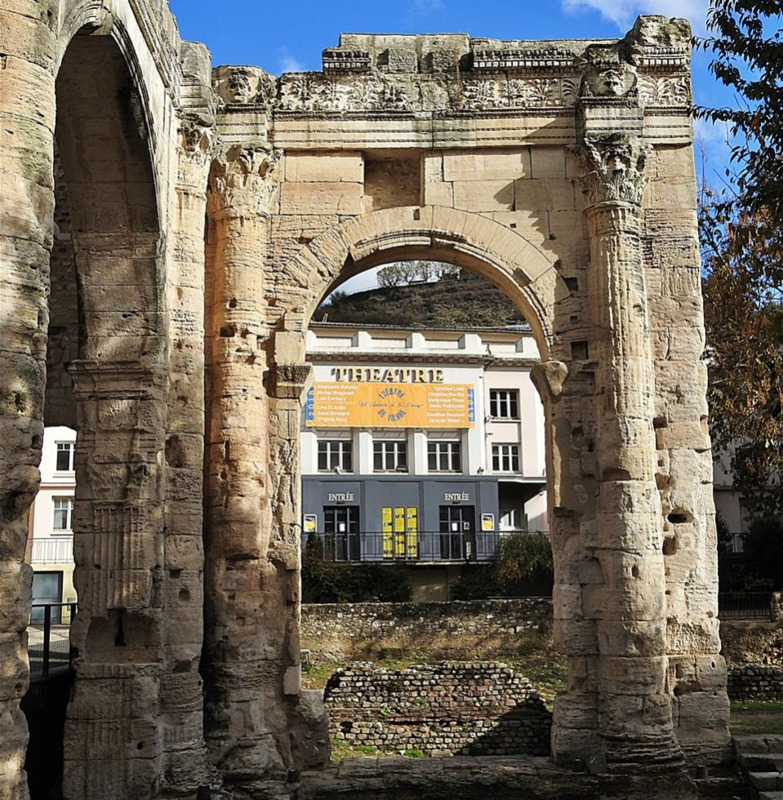 Some meters from the theater on the western side of the hill (Rue du Cirque) is built the 1st ce AD Roman Theater (Théâtre Antique de Vienne) . The Roman Theatre’s terraces stand on Pipet Hill’s steep slopes. In ancient times and following major retaining work, the summit was a religious esplanade whose temples and divine statues formed a sacred extension to the theatre. 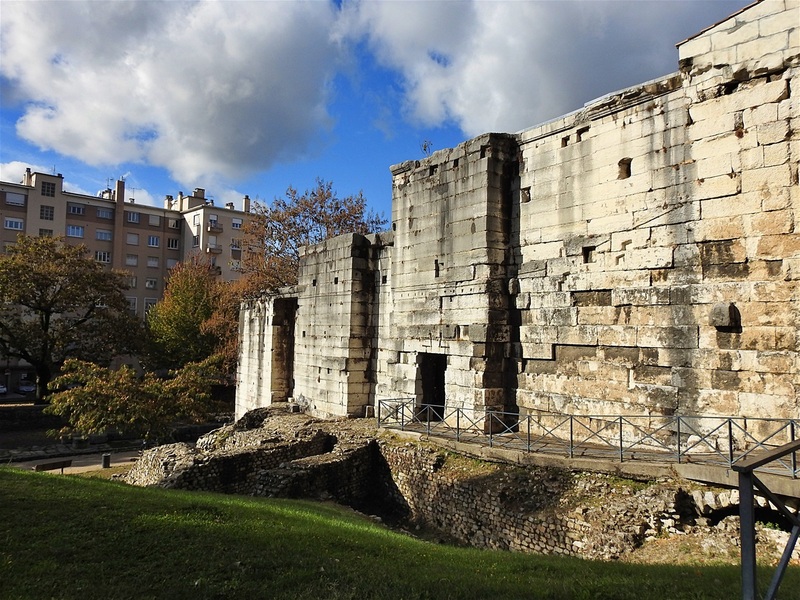 The theater could host around 13,000 spectators making it one of the largest urban theaters in the Roman Empire, the second biggest in Gaul after the one in Autun. Its layout was in keeping with the Latin stone theatre model, despite the anchoring in the rock resulting in specific requirements. Circular vaulted corridors formed the skeleton for the cavea’s terraces and were used by spectators to get around. The stage wall’s façade (adorned by columns and statues) and the side stage buildings with the terraces formed an enclosed environment with no way of getting outside. These parts of the theater have not survived today. 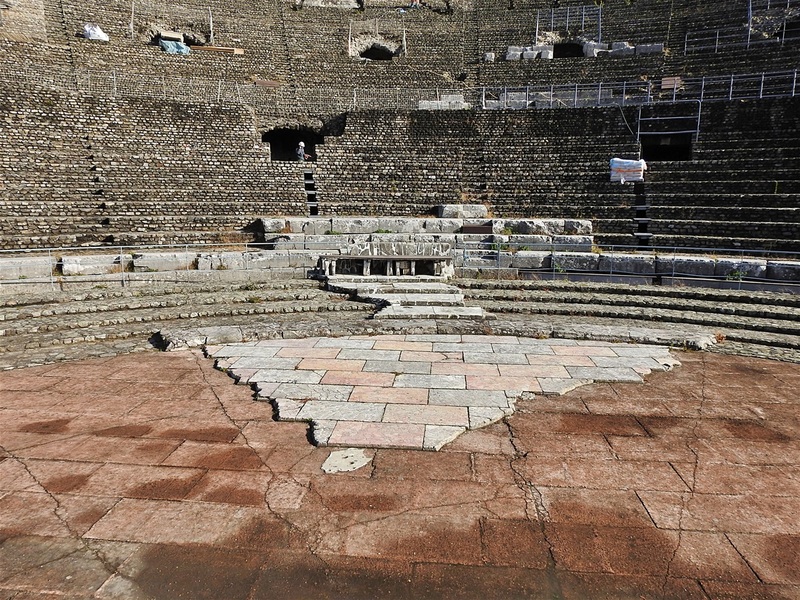 The Orchestra and the lower cavea of the Roman Theater (Théâtre Antique de Vienne). The Roman theater at the foothills of Pipet Hill. 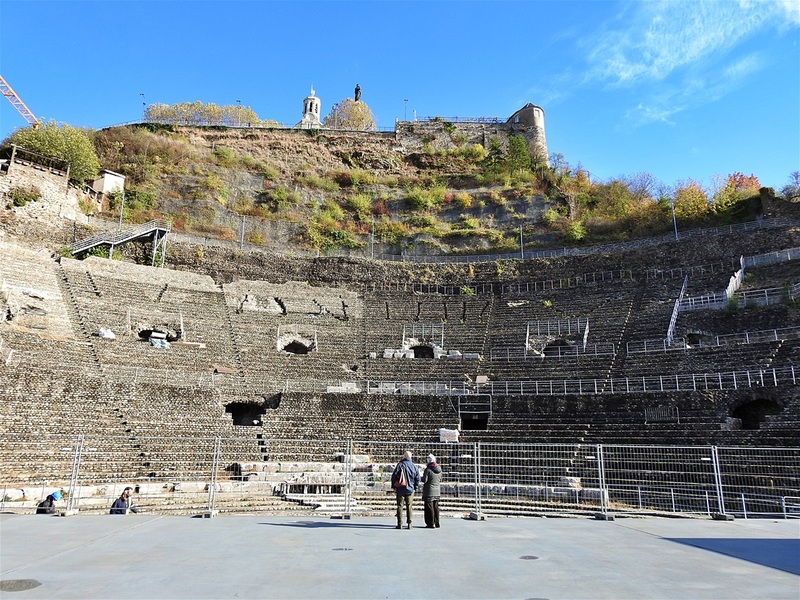 Like in every Roman city, the theater in Vienne embodied civic community, but it wasn’t just used for entertainment (plays, dramas, pantomimes, musicals, dances, sporting battles etc. ); it also could be used for civic and official gatherings. The religious aspect of the building was clear inside the theatre with a small sanctuary at the top of the cavea and depictions of religious scenes on sculptures that would have adorned the building. It wasn’t until excavations between 1908 and 1938 that the monument was unearthed and restored after being buried beneath thousands of square meters of earth. Following its restoration, summer line-ups revived the theatre’s role as an entertainer: operas, musicals, dances and a jazz festival that is now seen as the first of its kind which began in 1981. The entrance to the site costs 3 € and gives you access to the the stage (orchestra) of the theater. The Roman Theater (Théâtre Antique de Vienne). Later, in the 2nd ce AD, the theater was paired with a second smaller theatre, the Odeon , built nearby on the south side of the Saint-Marcel ravine. One can continue down Rue du Cirque, cross Montée Saint-Marcel and then climb up Montée de L'Odeon to reach the Odeon site. But, there is no reason to do that, as there is no access to the Odeon. Nevertheless, Oden is not restored and one can see only some ruins through a locked metal door. 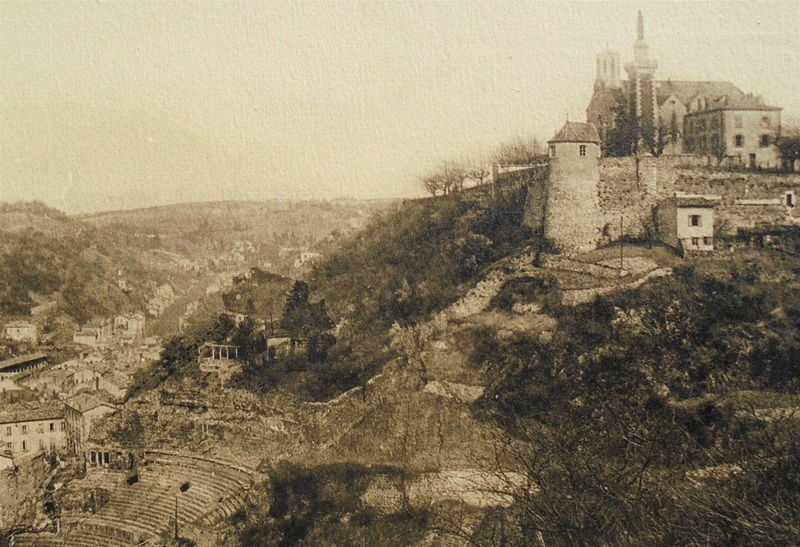 The Saint-Marcel ravine where the ruins of the Odeon stand. The supporting built by the Romans on top of Pipet Hill walls are still visible today. 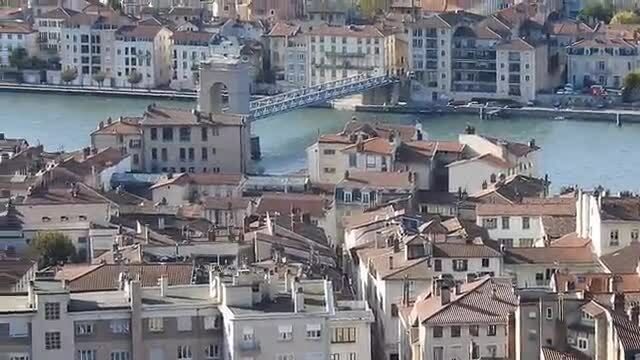 While here, is a good idea to climb up the top of Pipet Hill (Belvédère de Pipet) , to admire the best views of the city and the Rhone valley to the west. Exit from the theater and follow Rue du Cirque on your right. At the first crossroad follow the road to the right, Rue Pipet. Rue Pipet is quite steep and goes around the hill. This is an old Gallic road leading from the city to the east. In about 300m turn on the first road on your right, which takes you to the very top of the hill. The Pipet Hill depicted on a (late 19th/early 20th century) postcard. On the summit of the hill, in the Roman era was built a platform which forms a hemicycle 125 by 87 m, on the side overlooking the theater bellow. The supporting walls are still visible today. This sacred area with temples and sanctuaries forms a monumental axis with the theater and the forum below. In Middle Ages transformed into a fortress, which was destroyed in the mid-17th century. Pipet Hill. 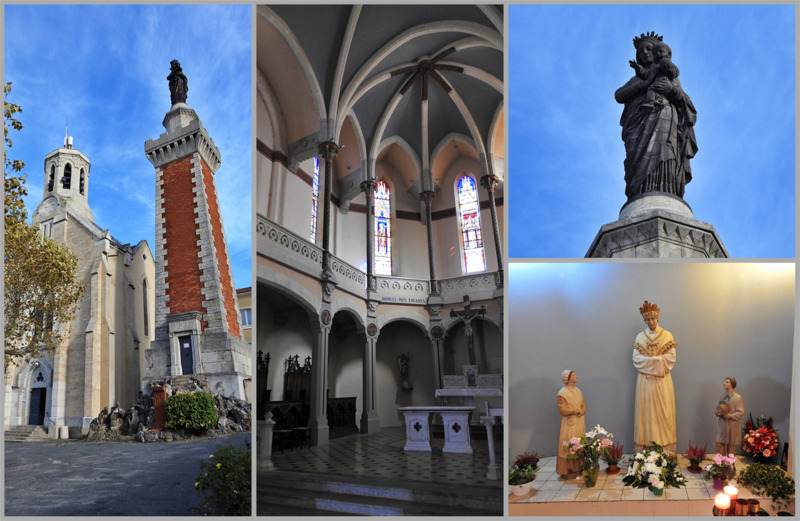 La chapelle Notre-Dame de Pipet and the stone statue of Our Lady. La chapelle Notre-Dame de Pipet and the Virgin Mary statue. 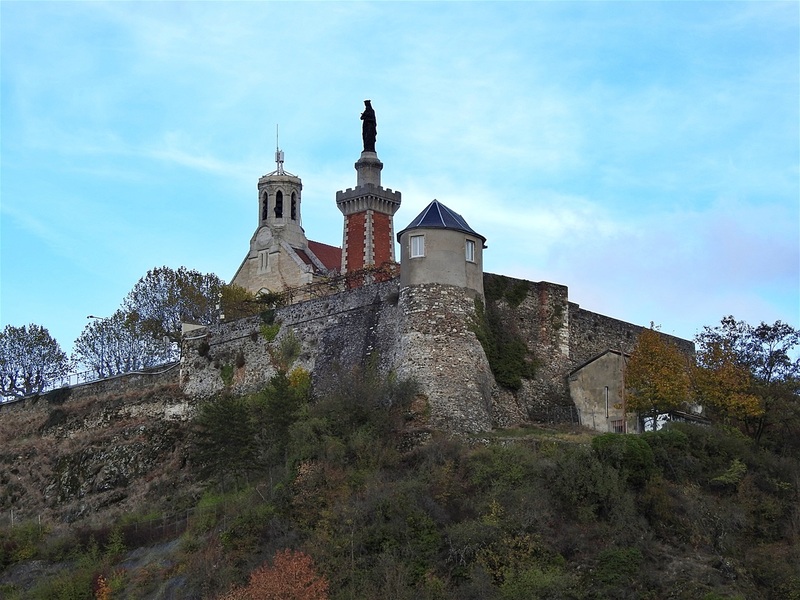 In the nineteenth century, this high place was dedicated by the citizens of Vienne to the Virgin Mary, with the installation in 1858 of a stone statue on a brick tower. In 1873, followed the construction of a chapel (work of the Viennese architect Abel Jouffray) of pilgrimage in honor of Our Lady (La chapelle Notre-Dame de Pipet). Inside, the stained-glass windows refer to the history of Viennese Christianity, including the origins, saints, martyrs and bishops. A view of the city from Pipet Hill. Almost from every part of the town on can see the Château de la Bâtie, which is built on a spur of Mount Salomon. 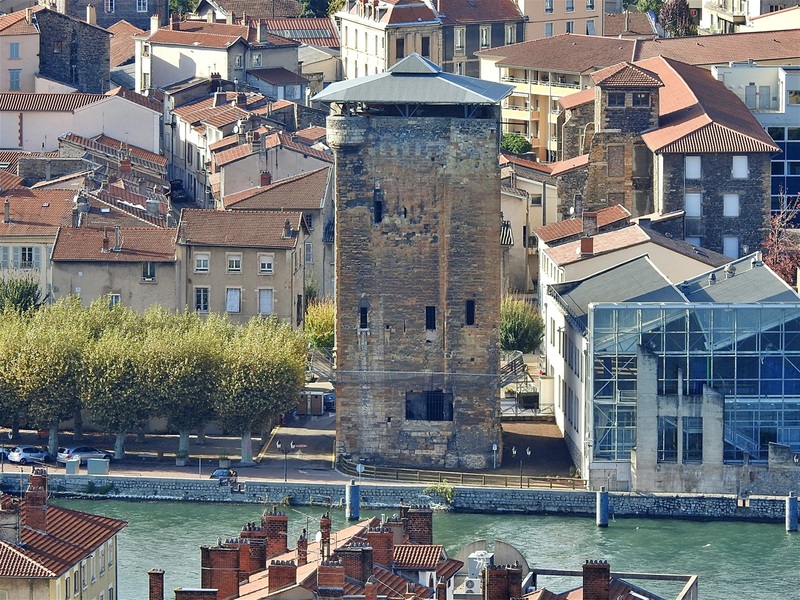 This medieval castle overlooks the confluence Rhône-Gère and the city. This strategic position was chosen by Archbishop Jean de Bernin (1217-1266). The fortress offered more security than the episcopal residence located inside the city. In addition, it was connected to the new urban enclosure that included part of Mount Salomon by using preserved sections of the Roman wall. In the fourteenth century, the castle served as a retreat during periods of unrest and was placed at the disposal of Pope Clement V during the council of 1311-1312. The defensive system was perfected by the drilling of gunboats at the end of the Middle Ages, and, at the beginning of the sixteenth century, by the construction of a bastion further to the east also equipped with gunboats. Château de la Bâtie on Mount Salomon. The castle is not open to the visitors. Back on Rue Victor Hugo, turn left to Rue Nicolas Chorier and then right to Montee des Epies. This alley passes under the highway (D41J) and continues as Rue Joseph Martin over a stone bridge. The Pont-Saint-Martin is a bridge  that crosses the Gère River and connects the rue Joseph Martin with the homonymous church of Saint-Martin and Place Saint-Martin on the right river bank. 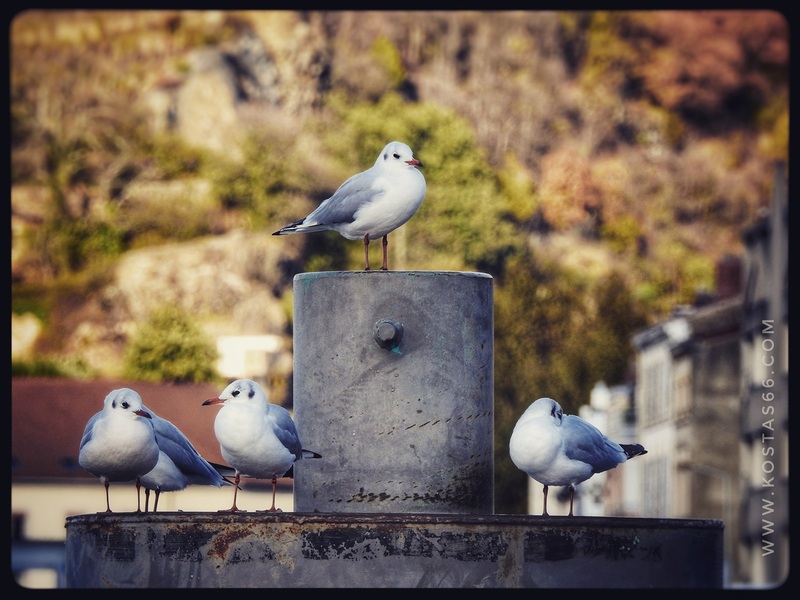 Not only the bridge, but also the old buildings around it, offer the perfect setting for the pictures that will impress your Instagram followers. The neighbourhood on the left bank of Gere River, next to the Pont-Saint-Martin, now and then. The Gère River close to the point of confluence with Rhone River. The Pont Saint-Martin dates before the early 11th century. 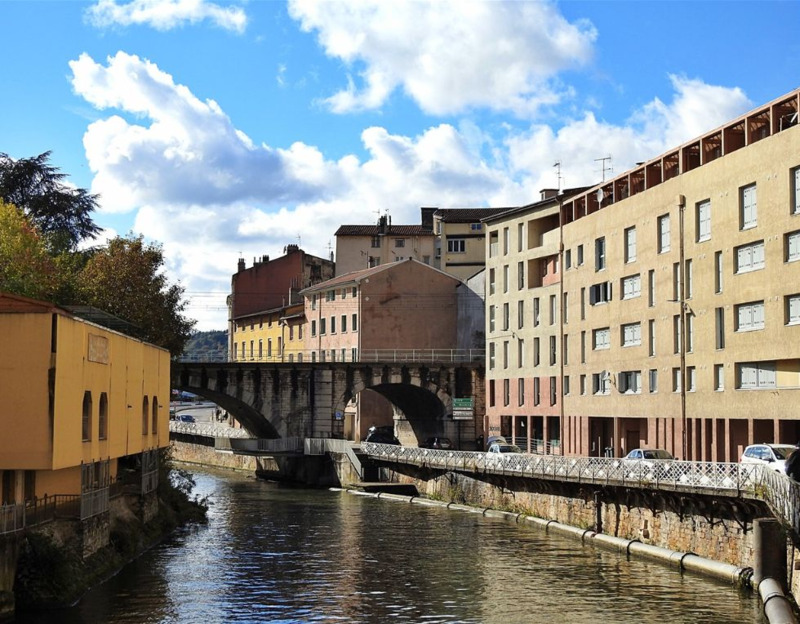 Documents of that period inform us about the existence of a double passage over the Gère going from the city center to the suburbs of the right bank, and that the ground which stretched from the rampart of the city to the loop of the river was called "Between two bridges". It must be taken for granted that these two bridges are of Roman origin. Indeed, the closest to the confluence of the Gère and the Rhone (today at this place there is a concrete bridge) marked the starting point of roman roads. In the Middle Ages, the bridge took the name of St. Martin because of the nearby church. Late 19th century picture of Pont-Saint-Martin (left) and a later picture of the confluence of Gere River (right). The stone bridge rebuilt in the beginning of the 13th century by Jean de Bernin (representative of the Pope in the area), but did not last much more than a hundred years. 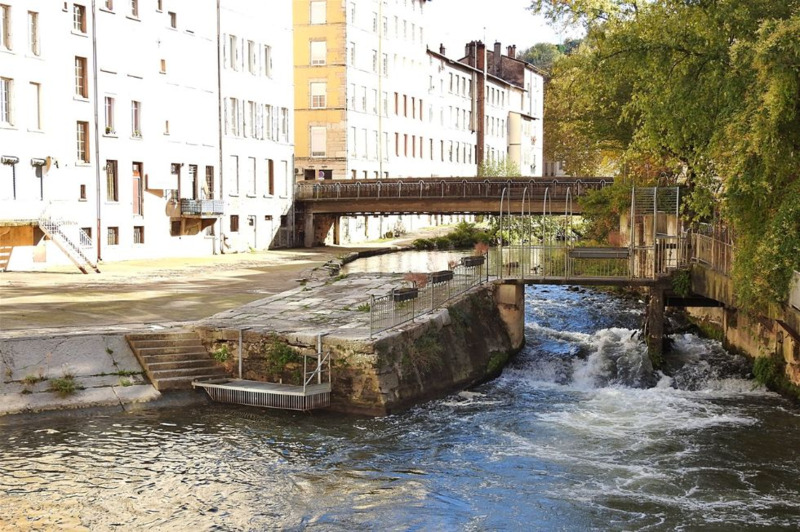 Around 1375, a flood of the Gère River overturned it and a wooden bridge replaced it for a few years. 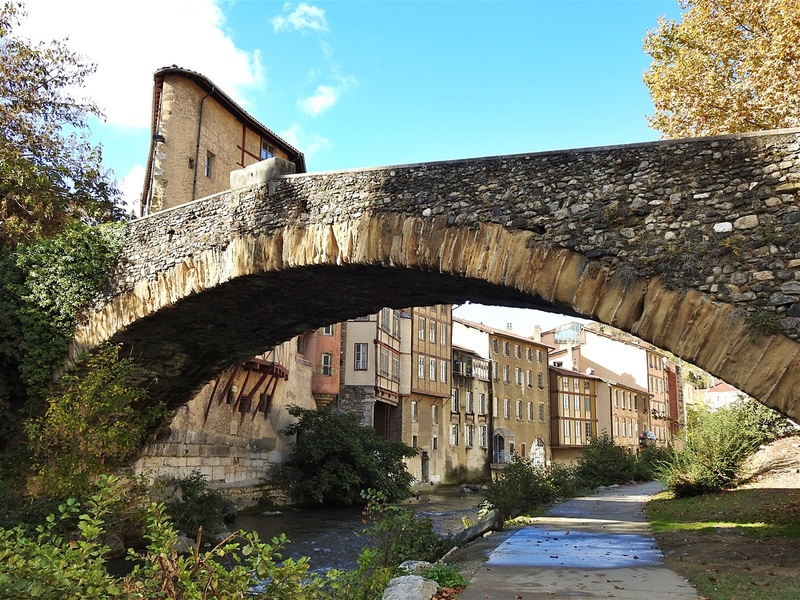 Finally, in 1399, the city rebuilds the stone bridge. Some years later, houses started to be built in the area, thus giving at neighborhood of Pont de Saint-Martin, the physiognomy we still see today. The second brifge on Gere River, just some meters downflow. Follow the right bank of the Gère river, to the confluence. 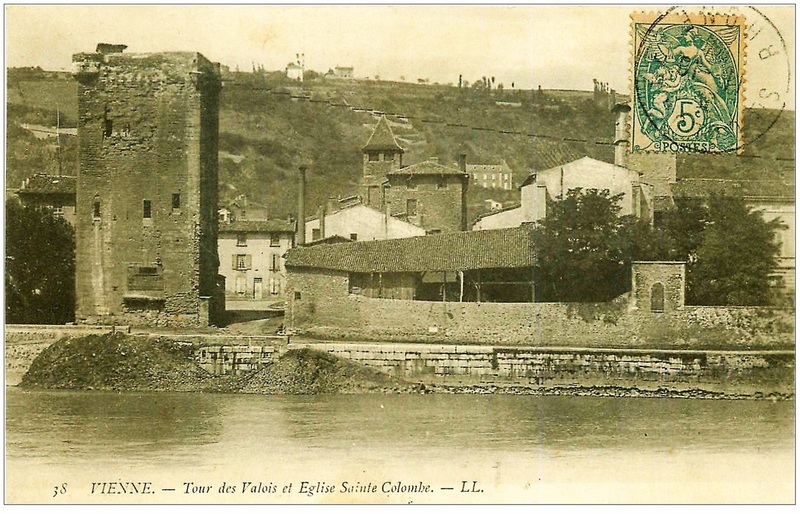 I strongly recommend that you cross the Pont de Lattre-de-Tassigny to the other side of the Rhone River and visit the Musée Gallo-Romain & the archaeological site of Saint-Romain-en-Gal (In the page I have dedicated to it, you will find lots of pictures). Musée Gallo-Romain & the archaeological site of Saint-Romain-en-Gal. 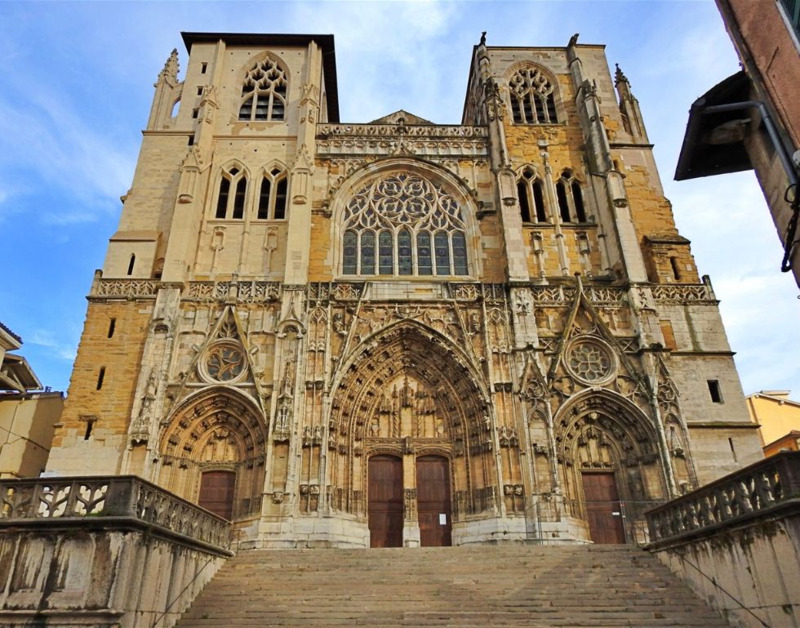 Behind the big crossroad, which is formed at the eastern end of the bridge Lattre-de-Tassigny bridge, on Place du Jeu de Paumestands, stands the impressive Abbey of Saint-André-le-Bas (Abbaye de Saint-André-le-Bas) . Église Saint-André-le-bas seen from above. The monk's abbey, which was built most probably in the 6th century AD, was one of the most important monasteries of the diocese of Vienne during the Middle Ages. Today, the only buildings left are the church and the cloister. 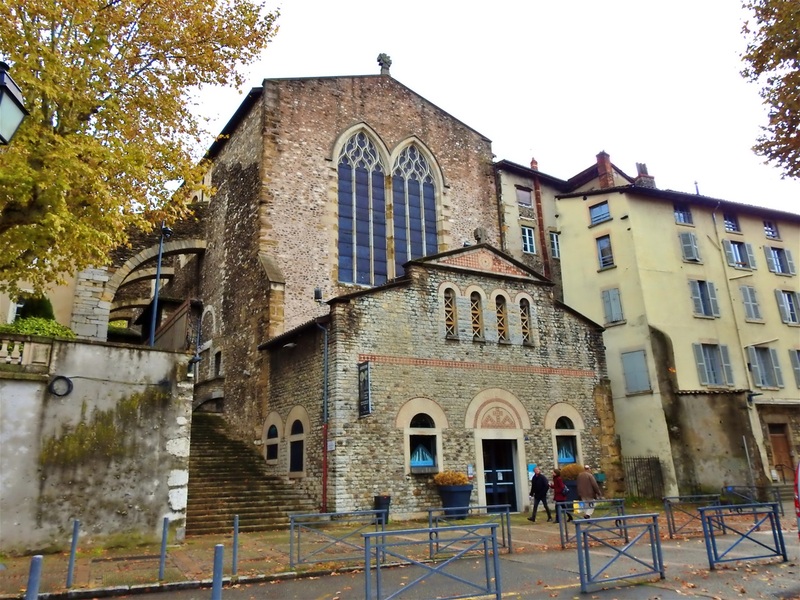 The abbey church (Église Saint-André-le-bas), which at the end of the 9th century functioned as the Chapel of the palace of King Boson of Burgundy, was remodeled in the 11th and 12th centuries. This rebuilding operation was made possible by the monastery's considerable prosperity. The abbey continued to be extremely powerful in the 13th century. Église Saint-André-le-bas seen from side (Rue de la Table Ronde). With its semicircular apse framed by powerful columns and capitals largely inspired by antique models, the church is especially remarkable for its sculpted Romanesque ornamentation (capitals, columns, friezes ...). 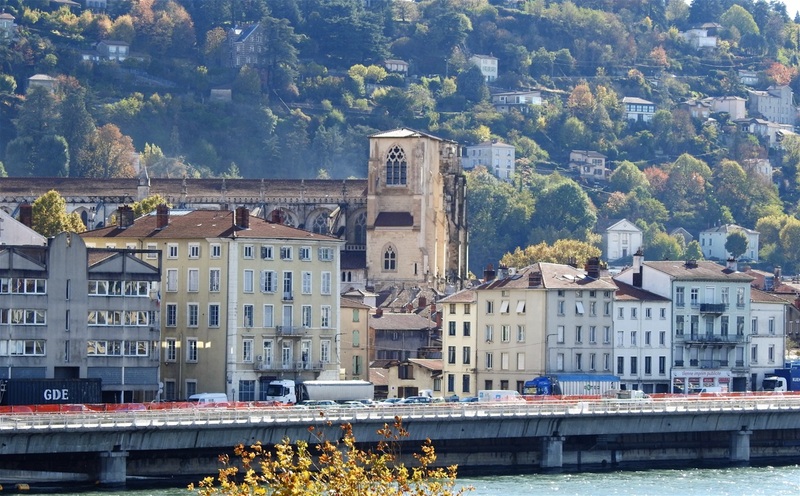 In 1841, the unfinished face of the church (overlooking the Saone River) was damaged by a fire. Some repairs followed and in 1927-1928 a forebuilding was built. In 1998, the forebuilding was designed to house the Heritage Center. The back side of Église Saint-André-le-bas (Rue des Clercs). 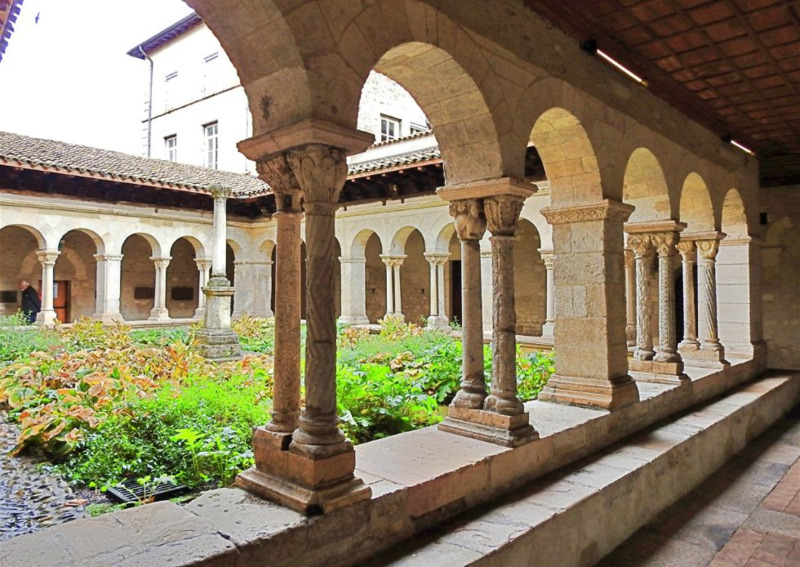 The 12th century cloister (Cloître Saint-André-le-bas) underwent several alterations and additions through the ages till 1860, when it was incorporated into a building and walls separated the gallery into several apartments. Finally, it was restored in the 1930s and inaugurated in 1938 as the museum of Christian Art, presenting collections of sculpture and inscriptions from the end of Antiquity and the Middle Ages. Since 1978, the cloister and the adjoining rooms have been used for temporary exhibitions. The grand staircase going up from the Place du Jeu-de-Paume was build in 1920 between the church and the cloister. Cloître Saint-André-le-bas. In the middle, the grand staircase going up from the Place du Jeu-de-Paume between the church and the cloister. 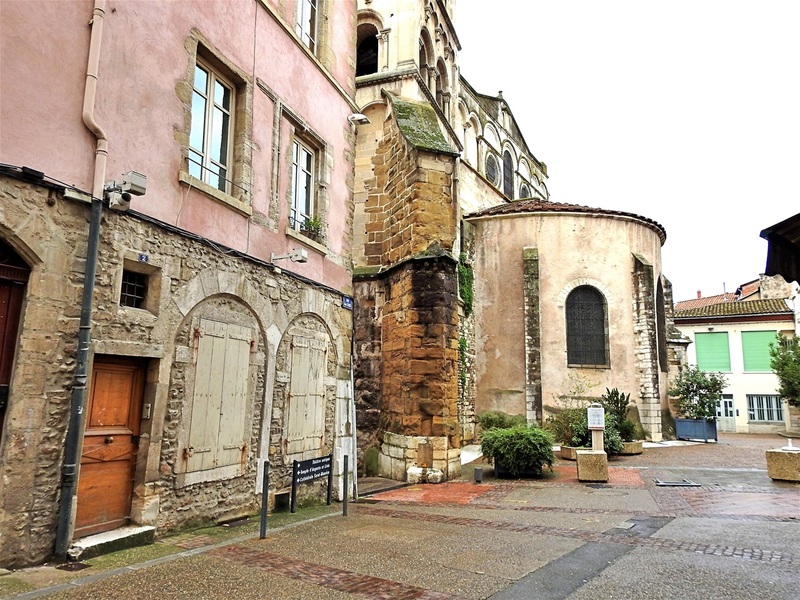 By the southern side of Église et le Cloître Saint-André-le-bas take the little Rue de la Table Ronde that leads to the back side of the church and the beginning of one of the most beautiful medieval streets of the old town: Rue des Clercs. 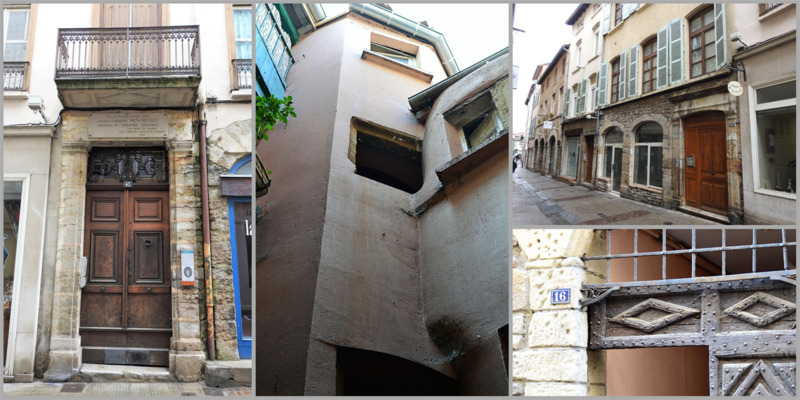 Walking in this small street, you really feel like being back in time, as on Rue des Clercs there are several fine examples of old houses of old Vienne. 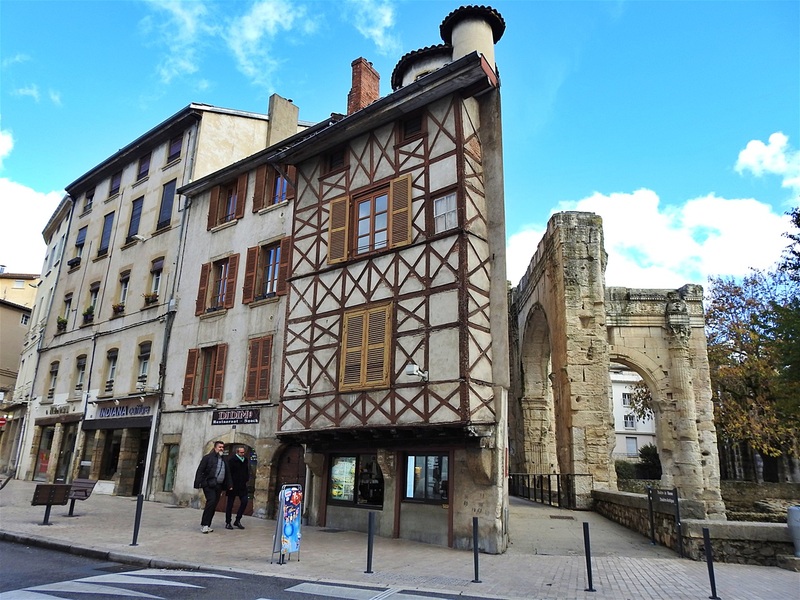 Stop to admire at least three of them: a) the 13th century “Maison 12-18 rue Des Clercs”; enter the no16 wooden door and look for the Romanesque facade located in the inner courtyard. 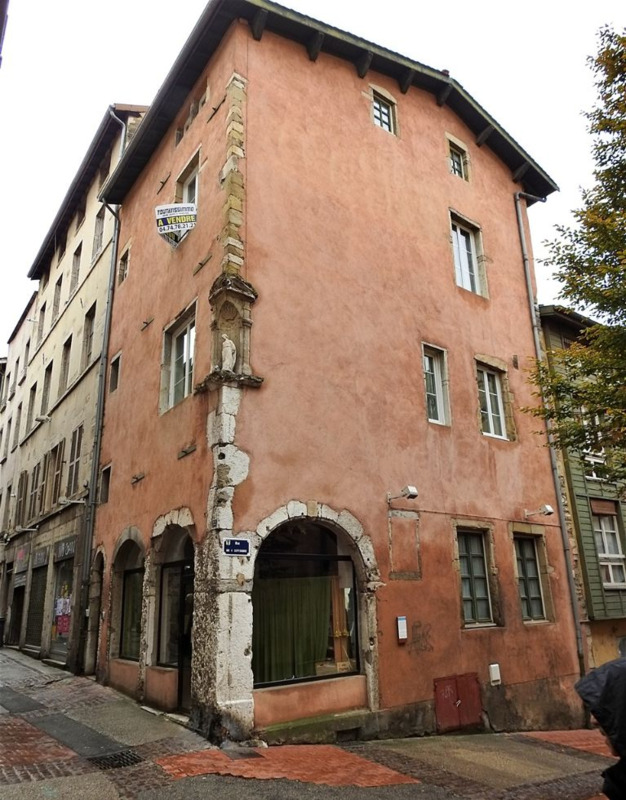 b) the 16th century three-storey "Maison 32-34 rue des Clercs" located at the corner with Rue du 4 Septembre bears a beautiful niche at its corner with a statuette in it; and c) the “Maison au 43 rue des Clercs”, which is the house where Laurent Mourguet, the creator of the Guignol Theater, died. "Maison 32-34 rue des Clercs". Rue des Clercs (top right). “Maison au 43 rue des Clercs” (left) and “Maison 12-18 rue Des Clercs” (middle & bottom right). 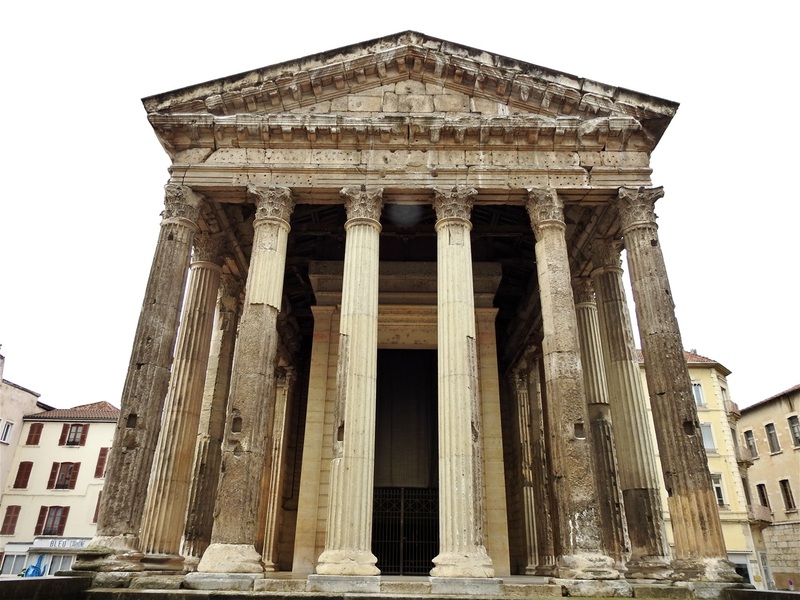 Rue des Clercs leads to the most impressive monument of Vienne, Temple d'Auguste et de Livie . But just before that, take a small detour by turning left on Rue de la Chaine to see the Town Hall (Hôtel de ville de Vienne) . Before 1768, the Hôtel de Rachais, was the property of Hugues, Marquis de Rachais, lord of Montferrat, Liergues and Mollaron, soldier in the Poitou regiment. After its reorganization in 1768, the city acquires in 1771 the private mansion to make it the Town Hall. 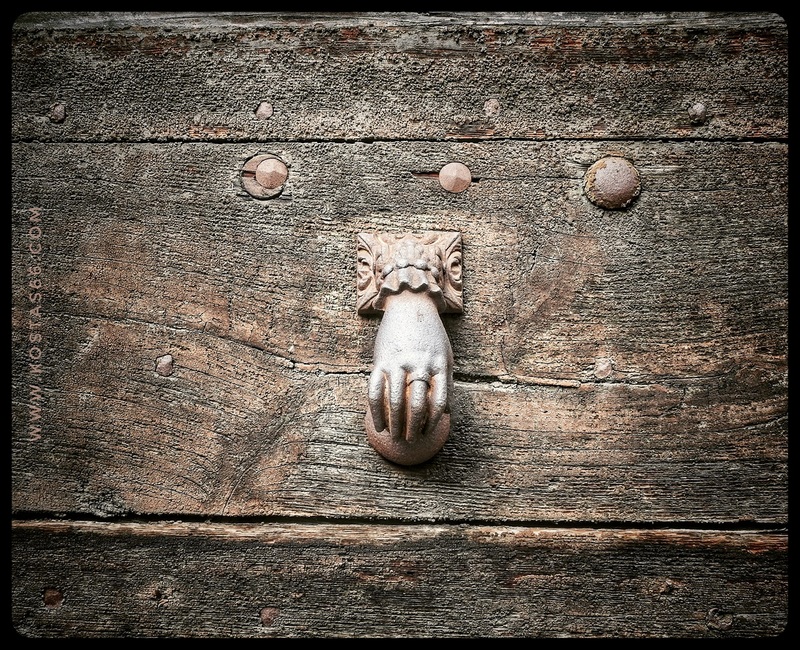 Those days the entrance to the building was from Rue Merchant through a carriage gate. The current facade has the porticoes at the ground floor, a loggia on the first floor, which is surmounted by a belfry and the public clock. Best of all the Roman monuments in Vienne is this striking Roman temple d'Auguste et de Livieright, in the heart of the old town. It really fascinates the visitor as it stands in the middle of a square surrounded by medieval and modern buildings, as well as restaurants and cafés. It looks almost unearthly and you feel like travelling back in time. It was built around 10 BC to honor Emperor Augustus and his wife, Livia. I had my coffee at the cafe with the funny name Toutatis (funny, as I have associated it with Asterix comix and the Phrase "By Toutatis!"). THe eastern side (entrance) of the Temple d'Auguste et de Livie. 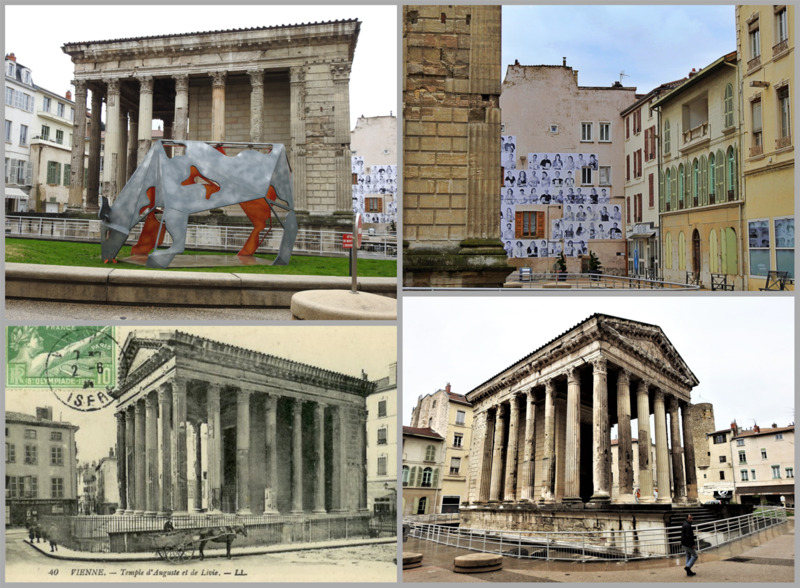 The temple is the only Roman temple preserved in France together with the “Maison Carrée in Nîmes”. Its transformation into a church in the Middle Ages ensured its safeguard. The temple is built in the heart of the Roman city. It is integrated into the forum, a vast public ensemble enclosed by colonnade porticoes. The temple is highlighted thanks to a podium. The temple follows the "Imperial Cult of ancient Rome" and is dedicated to Rome, Auguste and his wife Livie, as it is witnessed by the inscription on the upper part of the east facade. The people attended here several ceremonies, including offerings and very often practiced rituals of animal sacrifice to secure the favor of the gods. Only the priests reach the podium and a single room, the cella (or naos, the inner chamber of a temple), by the staircase, located on the east side. A blind wall closes the building to the west. A cella has the function of sheltering the representation of a god or a goddess. When Caius Octavius Thurinus became emperor in 27 BC, the Senate named him Auguste and recognized his divine qualities. Livia was deified in AD 44 by Emperor Claudius. Temple d'Auguste et de Livie. The Imperial Cult of ancient Rome identified emperors and some members of their families with the divinely sanctioned authority (auctoritas) of the Roman State. Its framework was based on Roman and Greek precedents, and was formulated during the early Principate of Augustus. The temple is preserved thanks to its transformation into a christian church, perhaps as early as the 6th century (Notre-Dame-de-la-Vie). This caused significant changes: the cella is destroyed and the spaces between the columns were clogged. At the Revolution the church closed down. 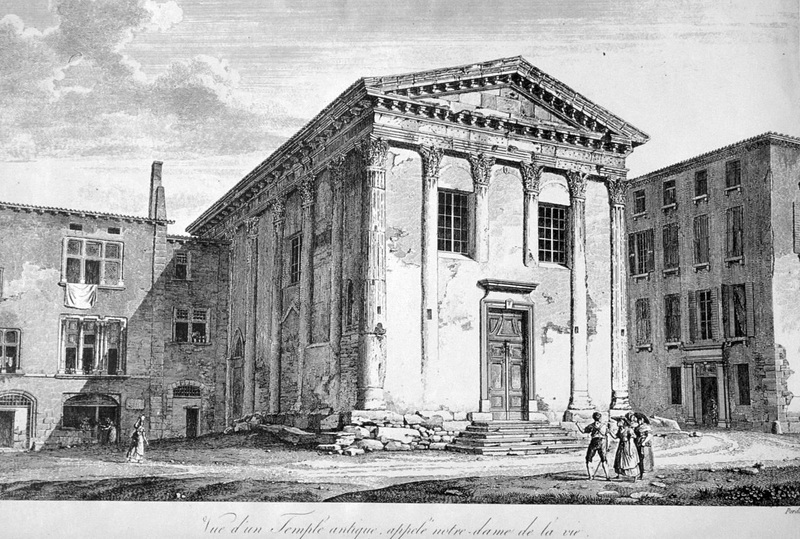 The restoration of the temple, conducted between 1852 and 1880, resulted in the destruction of the remains of the church. The cella was rebuilt. Palais de Justice de Vienne and the Tour du Roi. The Temple d'Auguste et de Livie is located in the center of the medieval town, in what is today the Place Charles de Gaulle. 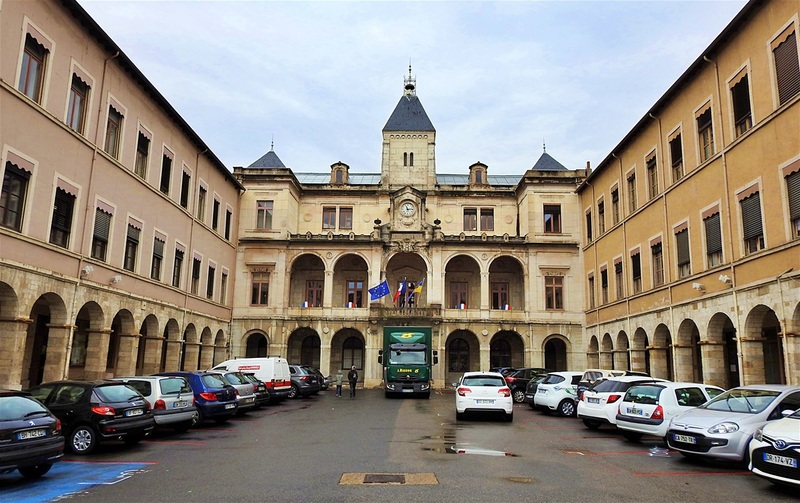 In the north of the square is located the Palais de Justice de Vienne, the old courthouse, still in use today. On the east façade of the courthouse stands the impressive brick medieval tower, known as Tour du Roi, which used as its detention center till early in the 20th century (1926). Place Charles de Gaulle. 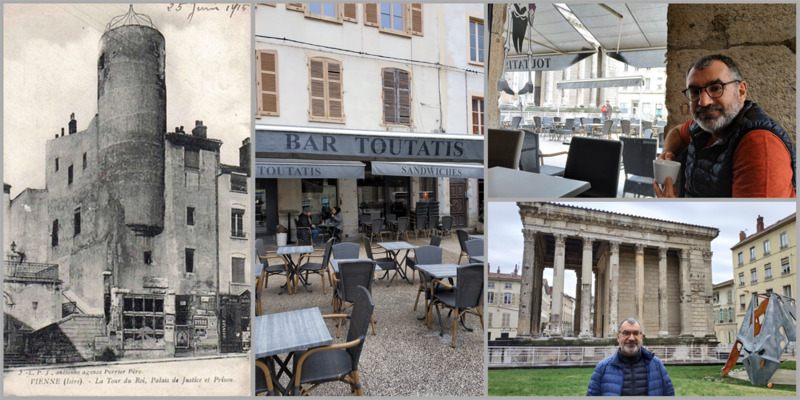 Tour du Roi in 1915 (left), Cafe-Bar "Toutatis" (middle & top right), and happy me in front of the Temple (bottom right). Vienne Cathedral seen from the right bank of Rhone river. The view from the west facade of the cathedral towards the Rhone river. Walk to the south on Rue Clémentine and you will see the back of the Vienne Cathedral (Cathédrale Saint-Maurice de Vienne) . Turn right at Place Saint-Paul and enter the cathedral from the side door open to the side square. 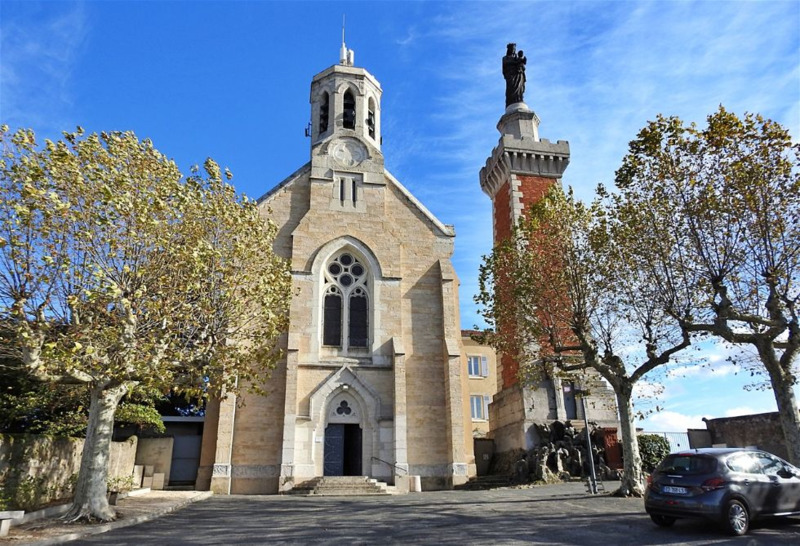 Mentioned as the burial place of the Burgundian king Boso of Provence in 887, no traces are left from the former church buildings at the site. Vienne Cathedral. 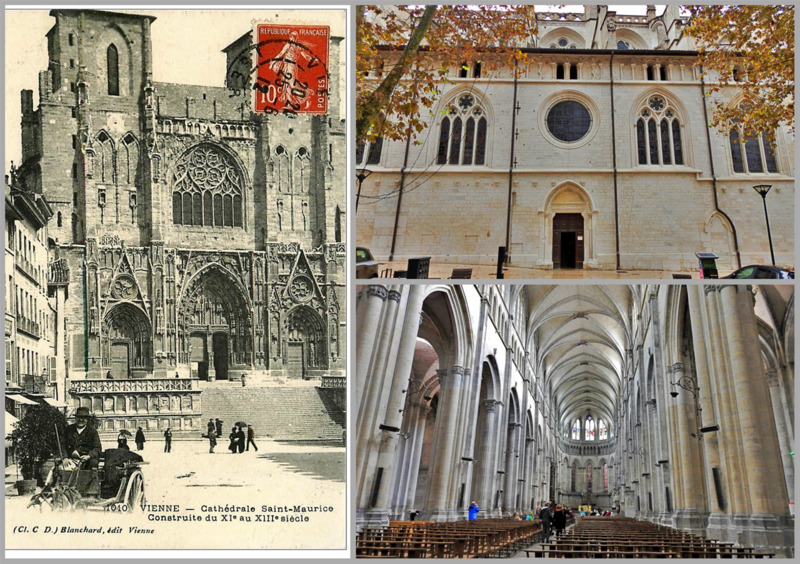 An old postcard (left), the side door (top right) and inside the cathedral (bottom right). 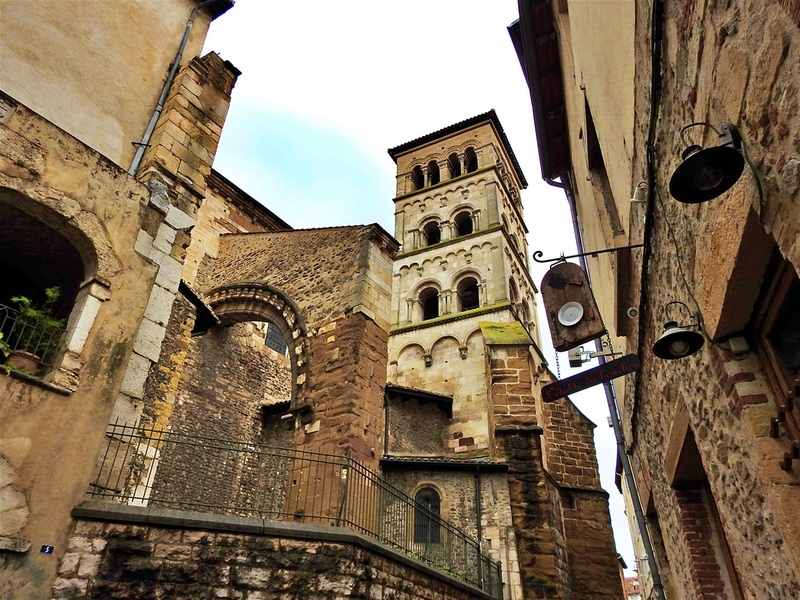 The construction of the present-day building begun in a Late Romanesque style, in about 1130. Built over a long period, Gothic modifications and extensions were carried out. The facade was added in the 16th century, with the capstone ceremony held in 1529. The church is a basilica, with three aisles and an apse, but no ambulatory or transepts. The most striking portion is the west front, which rises majestically from a terrace overhanging the Rhône and an impressive staircase. However, the sculptural decoration was badly damaged by plundering Huguenot forces under Baron François de Beaumont in 1562, during the French Wars of Religion. The west front of the Vienne Cathedral. The Cathedral seen from Pipet Hill. The French Wars of Religion were a prolonged period of war and popular unrest between Roman Catholics and Huguenots (Reformed/Calvinist Protestants) in the Kingdom of France between 1562 and 1598 It is estimated that three million people perished in this period from violence, famine, or disease in what is considered the second deadliest religious war in European history (surpassed only by the Thirty Years' War). A prominent event of these Religious Wars is the infamous St. Bartholomew's Day massacre,that took place in Paris in the night of 23–24 August 1572 and lasted many days resulting in the killing of thousands of Huguenots. But why the destruction of religious statues? The Reformed (Calvinist) leaders encouraged the removal of religious images by invoking the Decalogue's prohibition of idolatry and the manufacture of graven (sculpted) images of God (iconoclasts). In most cases, civil authorities removed images in an orderly manner in the newly Reformed Protestant cities and territories of Europe, but in other areas there were violent incidents. 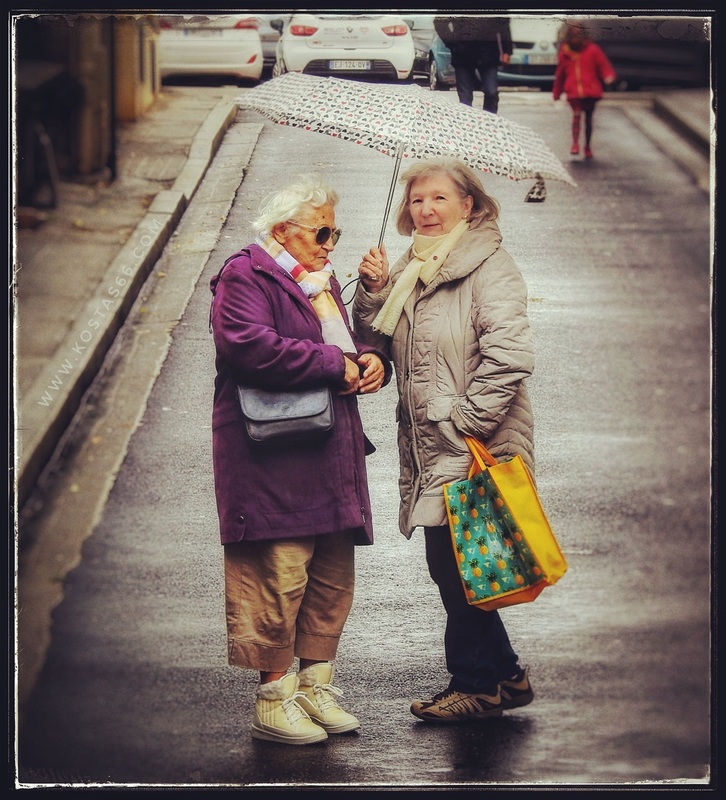 Ladies talking outsie the Vienne Cathedral. 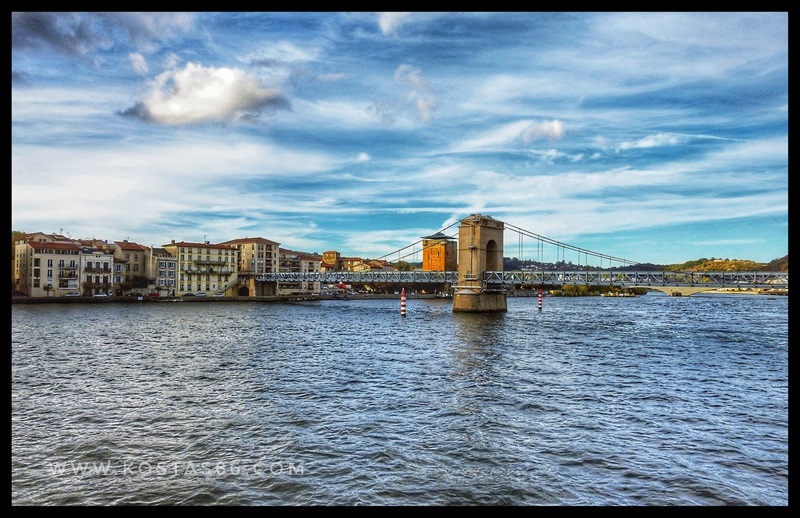 La Passerelle over the Rhone River. 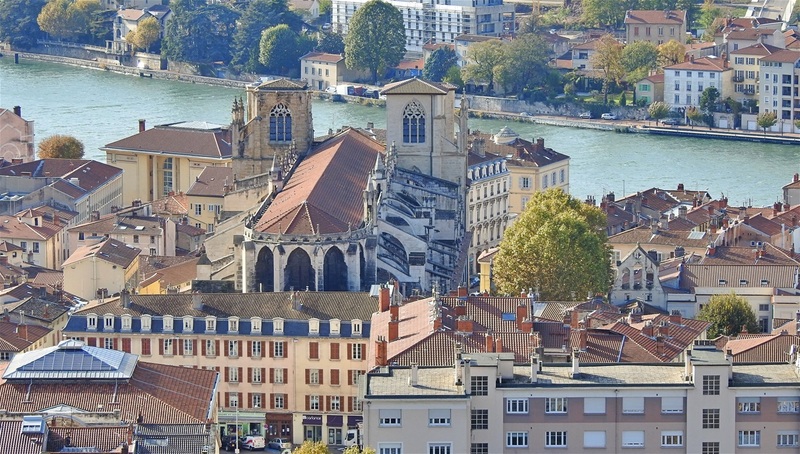 Step down the big staircase infront of the cathedral to the Rhone left bank and, if you have some time, walk halfway on the suspension footbridge (La Passerelle) , which connects the two banks of the river. From here you can enjoy a 360o view of the river and the city with its hills. There has always been a bridge at this location, but the metal one we see today is the 1926 bridge (it replaced the previous wooden one), which was rebuilt after the 1944 bombardment. La Passerelle today (left) and in 1912 (right). 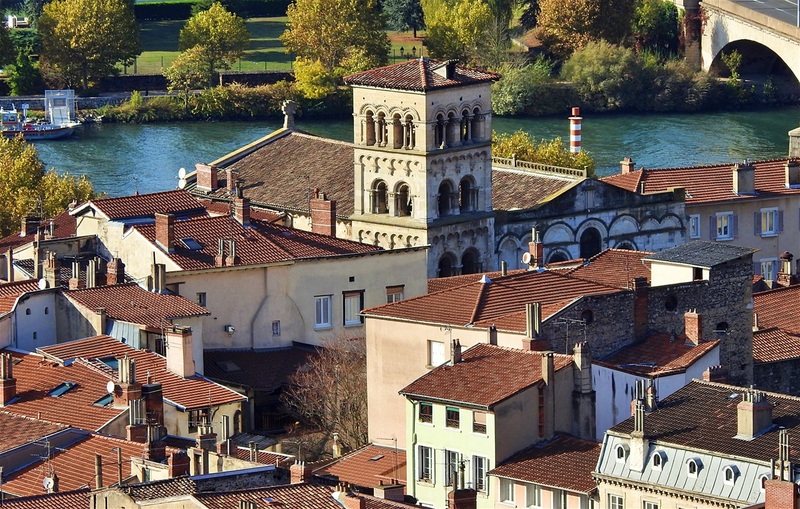 Tour des Valois, on the right bank of Rhone River. On the other side of the bridge, at Sainte-Colombe, overlooking Vienne, stands the Tour des Valois [16a]. This tower, almost of a square plan, is the only vestige of the fortifications raised in Sainte-Colombe. In 1335, Sainte-Colombe, which was part of the States of the Archbishop of Vienne is annexed to the Kingdom of France. 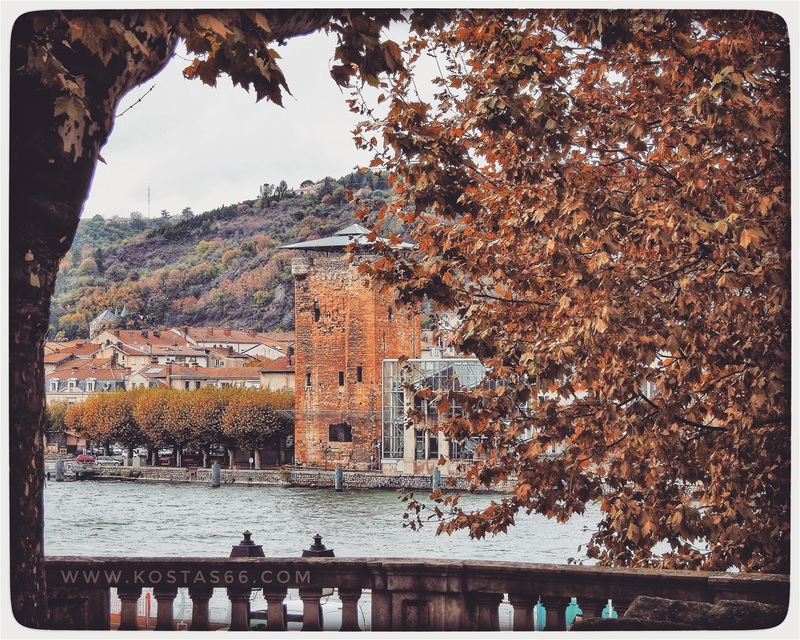 King Philippe de Valois built in 1336 the tower called "Valois" at the entrance of the bridge on the Rhone. It is intended to protect Saint-Colombe, but also to threaten Vienne, which the king wanted to acquire. 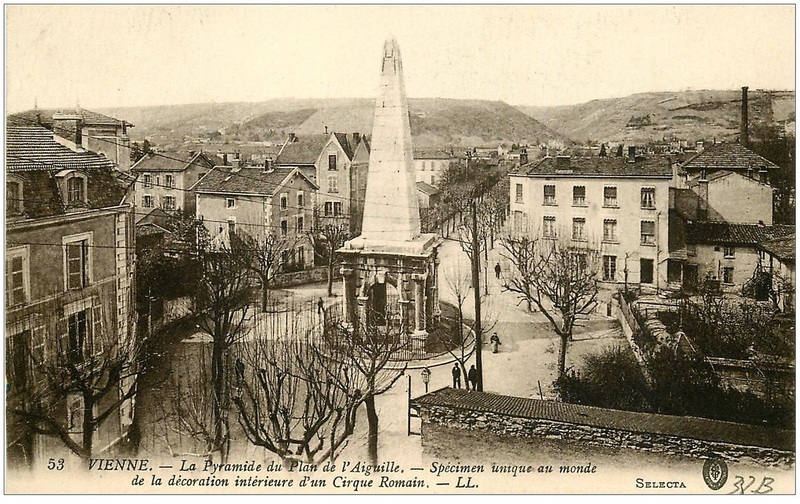 A 1906 picture (postcard) of the Tour des Valois and the church next door (Eglise Sainte Colombe). Almost 30 meters high, the tower is equipped with battlements and loopholes. Watchtowers occupy the corners of the upper terrace. Two interior staircases, now destroyed, served the floors and the platform. It is not open to visitors. Tour des Valois seen from the Cloître Saint-André-le-Bas. Back to Rue Boson, which passes in front of the cathedral and continue south to a small alley that has been transformed into a parking lot. Here stands one of the oldest surviving churches in France, Saint Peter's church (Église Saint-Pierre de Vienne) . Saint Peter's church was built at the end of the fifth century within the walls of the Roman city, situated at a cemetery which replaced a former residential area. It was dedicated to saint Peter and Paul and used as a funerary Basilica. 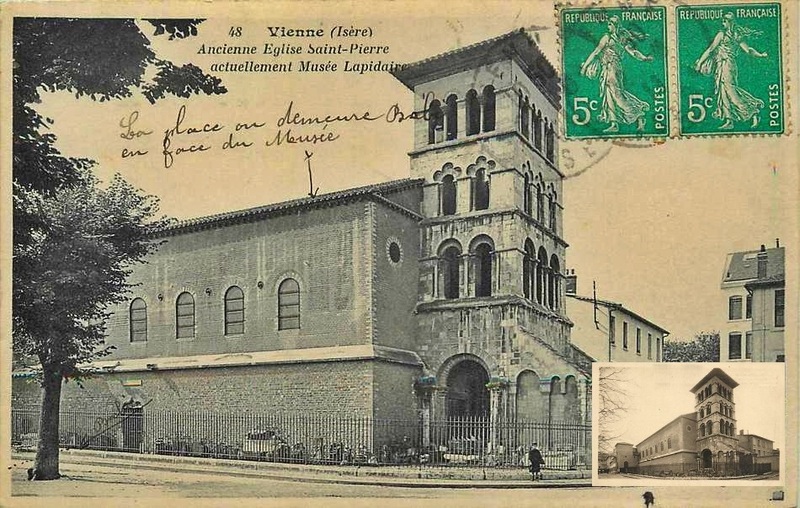 An old postcard Église Saint-Pierre de Vienne. In the 6th century a community of monks settled there. 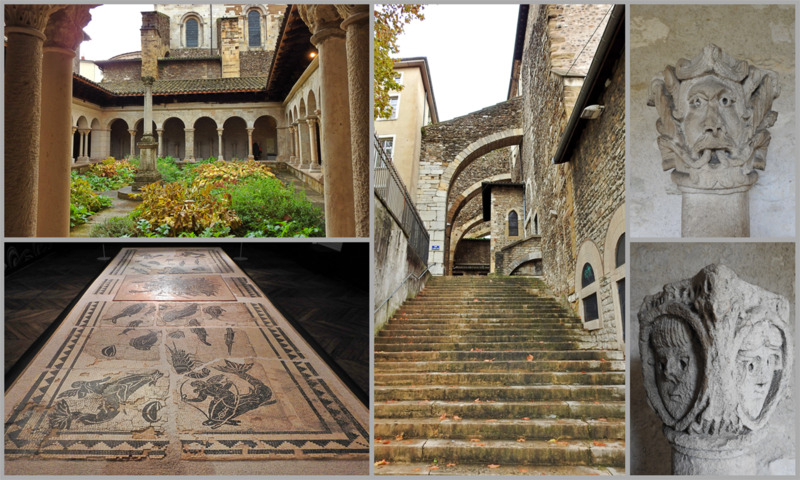 During the Middle Ages this abbey was the most influential of all of Vienne's monasteries. The church houses an important variety of relics, one of which is supposed to be a water cup of the "last supper". During the late Middle Ages and the early modern period, the competition of the mendicant orders and then the Wars of Religion permanently weakened the abbey. The church transformed into a museum in as early as 1809 and the building was restored during the 1860s. In 1872 the building was converted into a lapidary museum. The presentation of the collections has remained almost unchanged to the present day. Continue south to the Voie Romaine park . At the edge of the park, a modern building houses the Tourist Office of Vienne. 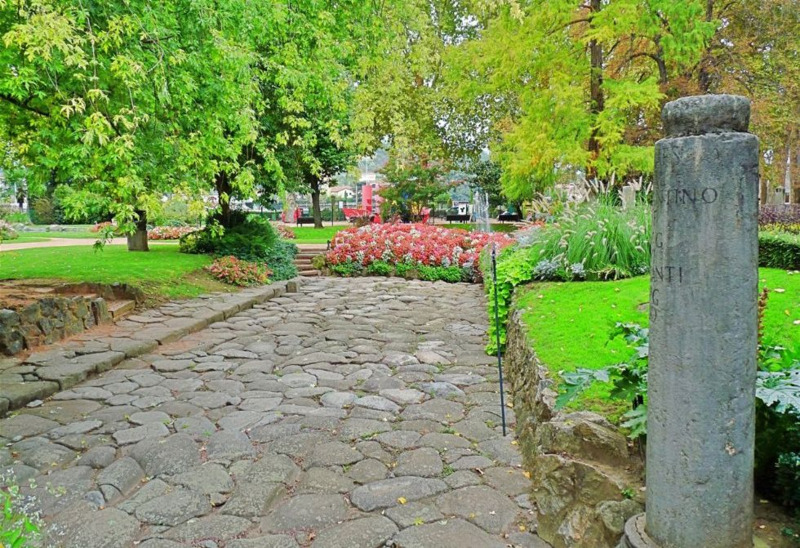 The landscaping of the public garden brought to light a Roman road paved with granite blocks. 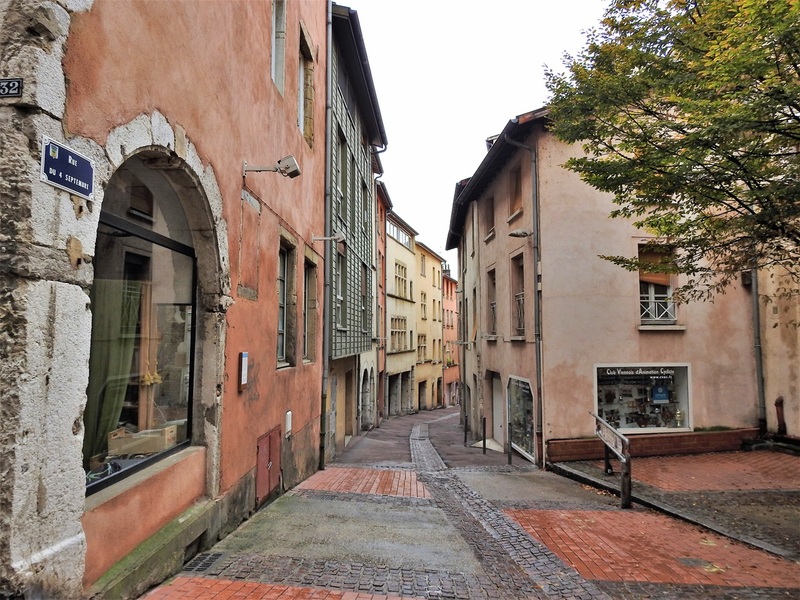 This street led to the northern annexes of the large warehouses that were built on the banks of the Rhone in the first century. A roadside marker (military) is erected on the edge of the street, transferred here from another road at the time of the Roman emperor Constantine (beginning of the fourth century). 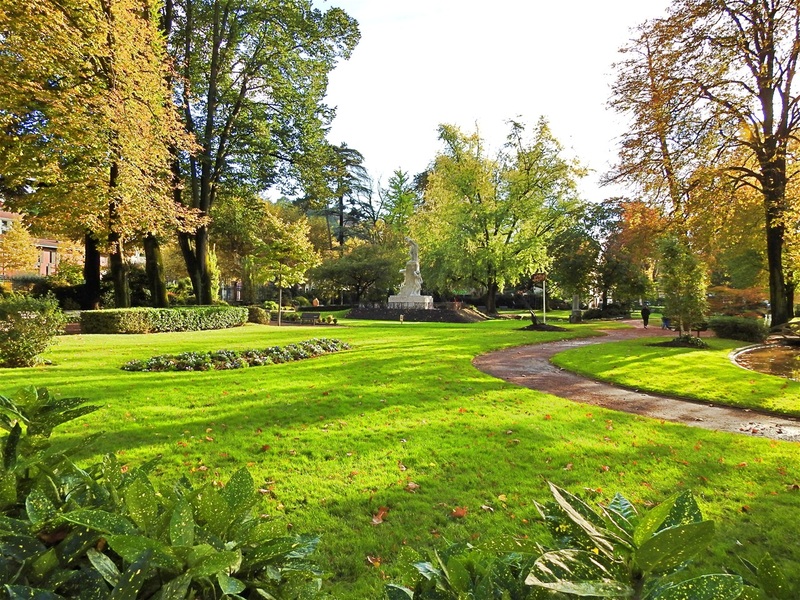 Voie Romaine park. The Roman road and the military marker on the right. 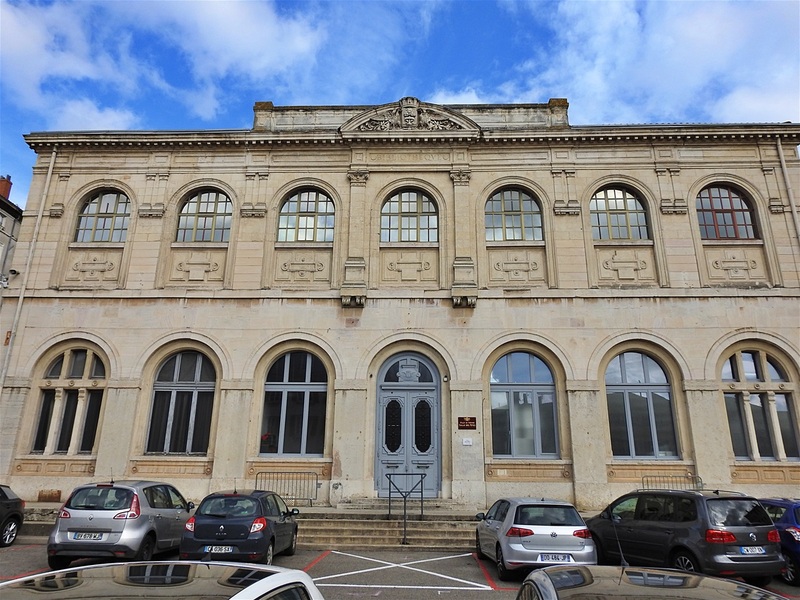 Opposite the park, on Cours Marc-Antoine Brillier, there is a modern building with arches, which form a lodge. Inside these arches is preserved a piece of the city ramparts (le mur d'enceinte romaine) . The emperor Augustus, in the 1st century BC, authorized the construction of a 7 km long wall around the city of Vienne. 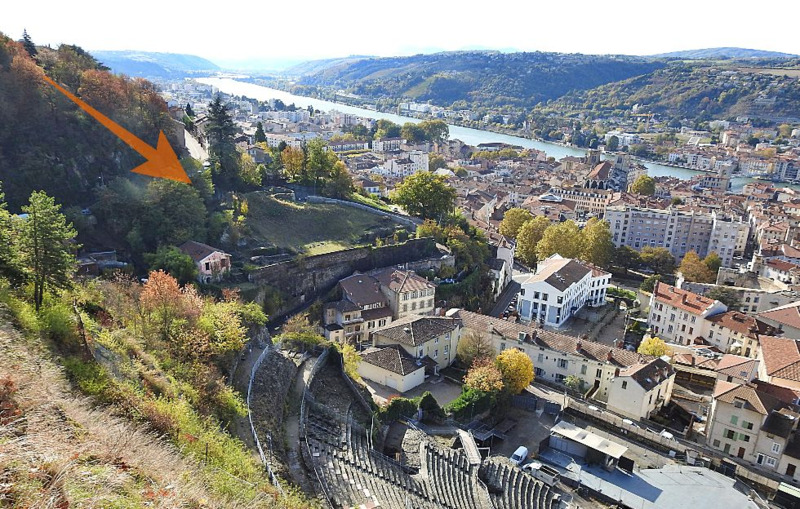 Of honorary value more than defensive, the enclosure concentrated on the Left Bank, was delimited by the 5 hills and bordered by the Rhone. This imposing construction was incorporated into the defensive system of the city until the 18th century. 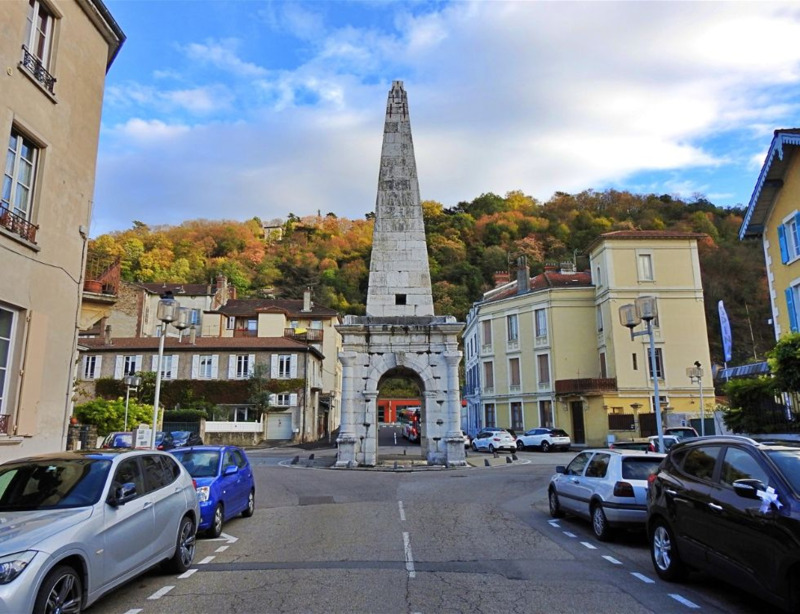 You may finish your walk at this point and go back to the train station, but in this case, you would have missed a very important monument of the Roman Vienne: Plan de l'Aiguille (Pyramide) . 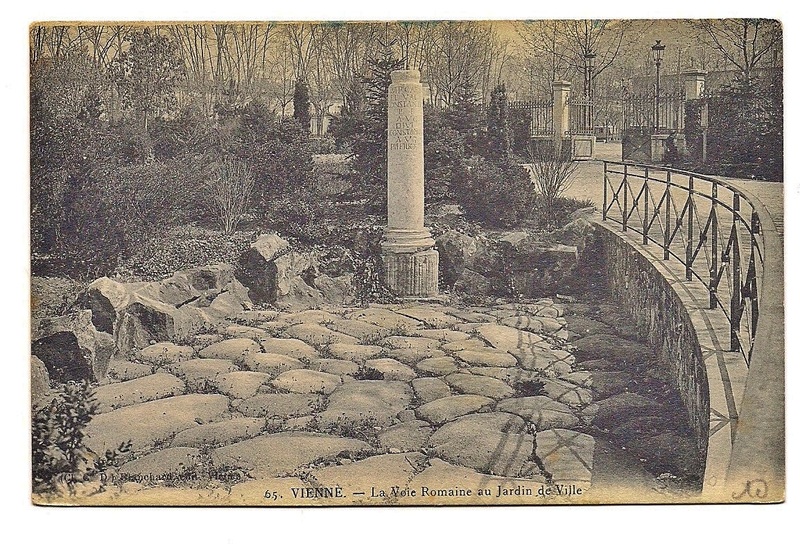 I would recommend you walk the 1km distance to the monument by following Cours de Verdun to the south. The impressive white Pyramid is located in the middle of a small roundabout in a residential area. It is supposed that the Pyramid is what has been left from the Roman Circus, and still marks today the center of the barrier (spina) in the middle of the track of the racecourse. Plan de l'Aiguille (Pyramid) photographed from the west. A 1916 picture of the Pyramide. This "pyramide" is in fact a stone masonry work restored and reminiscent of the shape of an obelisk, built on top of a tetrapylon in lieu of a pedestal. It may has replaced a real obelisk, now lost. The base is 7.45 m high and 6.20 m wide, the obelisk is 15.50 m high, which means that the whole structure is about 23 m high. Nicknamed the needle (l'aiguille) by the Viennese, the pyramid gave birth to several legends throughout the Middle Ages. The popular imagination considered it to be the cenotaph or memorial of the legendary founder of the city, Venerius. According to another legend, this is the mausoleum of Pontius Pilate. This last legend, supported by the newspaper "The Journey of Berlin to Nice", and a 1775 article by Johann Georg Sulzer, according to which, Pilate committed suicide in Vienne. That fed the vivid imagination of the locals, who easily adopted the idea of their city accommodating the "Tomb of Pilate". The Pyramide now and then. Here finishes a fascinating tour in this monumental city. Certainly, one day is not enough to explore the rich heritage of Vienne, and I would recommend a longer stay here. I thought that Vienne would make a great base to explore this part of France. Who knows…maybe someday I’ll be back.